Let’s start with a quick refresher on where we’re at. There have been strong countervailing forces exerting themselves on Australia’s economy this year, and this is why the cash rate has gone through an unusual period of stability. The cyclical boost from the last easing cycle has not been sufficient to overcome the structural drag of the softening resource sector, and so the RBA has been unable to seriously countenance higher rates. 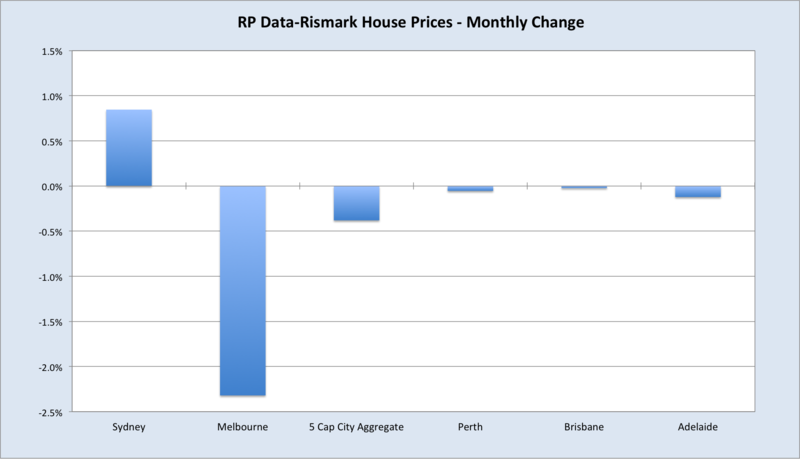 At the same time, house prices, especially in Sydney and Melbourne, have appreciated excessively, and this has left the RBA reluctant to cut further. As I’ve hopefully argued with clarity thenceforth, my view at the time of this blog’s establishment was that the structural headwinds battering the Australian economy were too potent for the traditional interest rate-exposed sectors (housing and consumption) to overcome, and so interest rates would fall further before they rose. I have strived to present all possible circumstances that would invalidate this view, but for me none of the arguments against further cuts has been satisfactory. Developments over the past month have mostly favoured a dovish view on rates. The most important has been the rout in iron ore prices, which has challenged widely-held expectations, my own included, that the final quarter of this year would deliver respite for iron ore producers. Economic policy in China is shifting to a more stimulatory footing, which many hope will presage an improvement in the fortunes of bulk commodities. However, there seems scant chance of the resumption in credit growth and investment being substantial enough to achieve this. Domestic capital expenditure held up better than expected in the third quarter, though was still down 8% from a year earlier. On the cyclical side, the housing prices were flat in November, with building approvals down sharply and credit growth accelerating slightly. 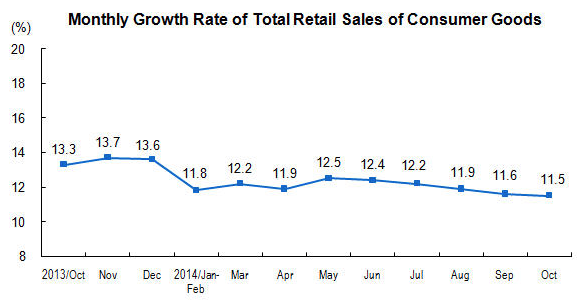 Retail sales were healthy enough, though households appear disinclined to eat into savings. There hasn’t been a material slowing of activity on the cyclical side to warrant cuts just yet, but neither is there much sign of sufficient pressure to raise them. The news this month for Australia’s key commodities has been dour. 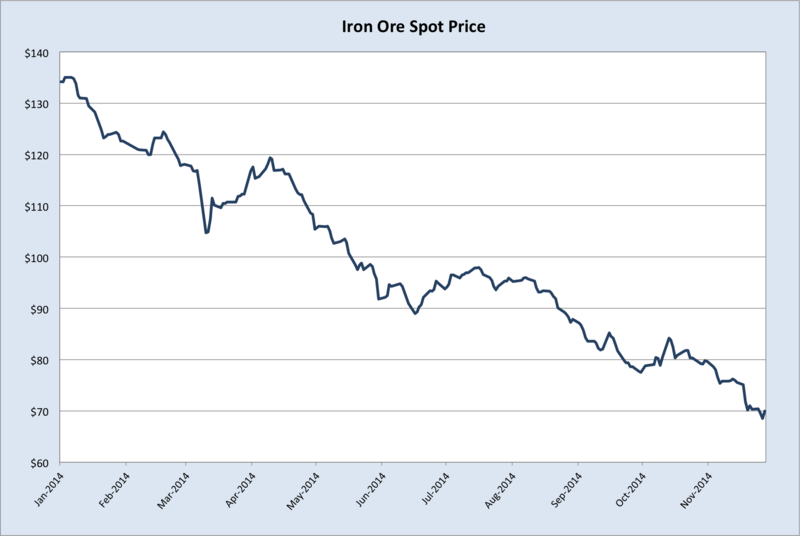 Iron ore has suffered grievously, a few months ahead of my expectations. There’s increasing agitation globally for reduced dependence on coal, and LNG is facing its own ‘iron ore moment’ due to lacklustre demand and crashing oil prices. This was a bit lazy, I will admit. Coal is Australia’s second largest export and so in that sense it will ‘continue to make a significant contribution’ to its export earnings. But what we’re concerned with here are rates of change. Will coal support additional gains in Australian living standards in the future? Very likely it will not. China’s demand for coal has underpinned the windfall in that sector over the last decade. Now that it’s facing severe environmental degradation and hazardous air quality, the government has announced a planned cap on coal consumption. Australia will need to look elsewhere if it wants to expand its export markets, and the only viable candidate really is India. India possess plenty of coal, but its inept state mining company has historically under-delivered. It is intent on changing this, with Power and Coal Minster Piyush Goyal recently declaring, “Possibly in the next two or three years we should be able to stop imports of thermal coal.” Whether this is achieved remains to be seen, scepticism is reasonable, but with China moving against it and oil and gas plentiful, it’s hard to get excited about the prospects for coal. In any case, whether or not coal will enjoy an unlikely renaissance in a warming world isn’t of much relevance to my purposes here; there’s effectively zero chance of a short-term rebound in coal that will alter Australia’s interest rate outlook. As such, I won’t bother discussing coal in subsequent interest rate updates unless there’s some news of note. 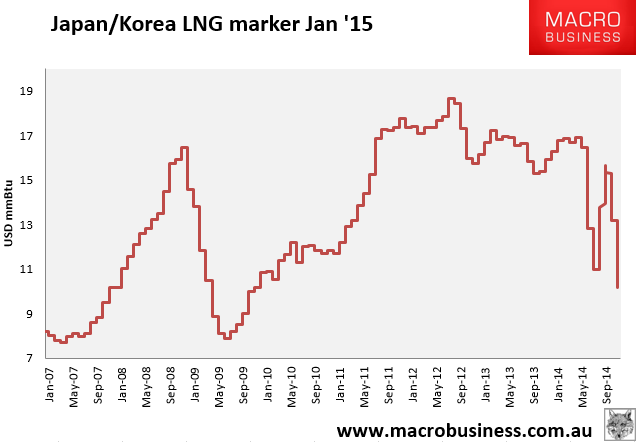 LNG is starting to get interesting. I haven’t got much in the way of LNG data unfortunately but this chart from David Llewellyn-Smith at Macrobusiness paints the picture. The Japan Korea Marker (JKM™) is the Platts LNG (Liquefied Natural Gas) benchmark price assessment for spot physical cargoes delivered ex-ship into Japan and South Korea. As these two countries take the largest share of LNG imports in the world, the JKM™ is thus a key reference in marking product value/market price from supply source to the destination market. In the LNG market space, traditional patterns of trade are evolving fast; where cargoes once changed hands only through opaque bilateral deals, the market now exhibits open sell and buy tenders for multiple and single cargoes, brokered trades, cargoes sold in longer chains and speculative trading positions taken up by non-traditional players, adding to liquidity on the spot market. The recent collapse in spot prices is all the more concerning coming as it has in the lead up to the northern winter. 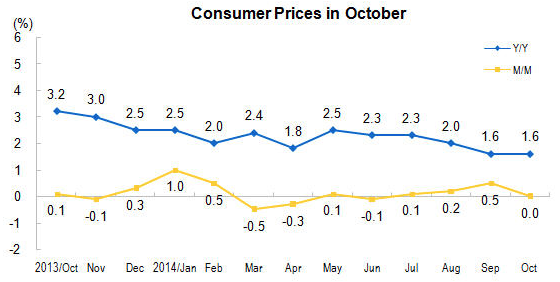 As you can see on the chart above, we’ve seen prices rise in previous years ahead of stronger winter demand. Kogas, which has a monopoly on domestic natural gas sales, sold 27.6 million mt of LNG over January-October, down 9.6% year on year. The state utility attributed the decline in domestic LNG sales to the restart of some nuclear power plants, higher coal demand for power due to its relatively lower prices than LNG and weaker power demand due to unseasonably mild temperatures. Kogas plans to work with other Asian LNG buyers to phase out the “Asian premium” that has plagued the region in the past due to the lack of bargaining power and rigid pricing practices, he said. LNG importers in South Korea, Japan and Taiwan have traditionally paid more for LNG cargoes due to oil-linked contracts and a lack of alternative energy sources. 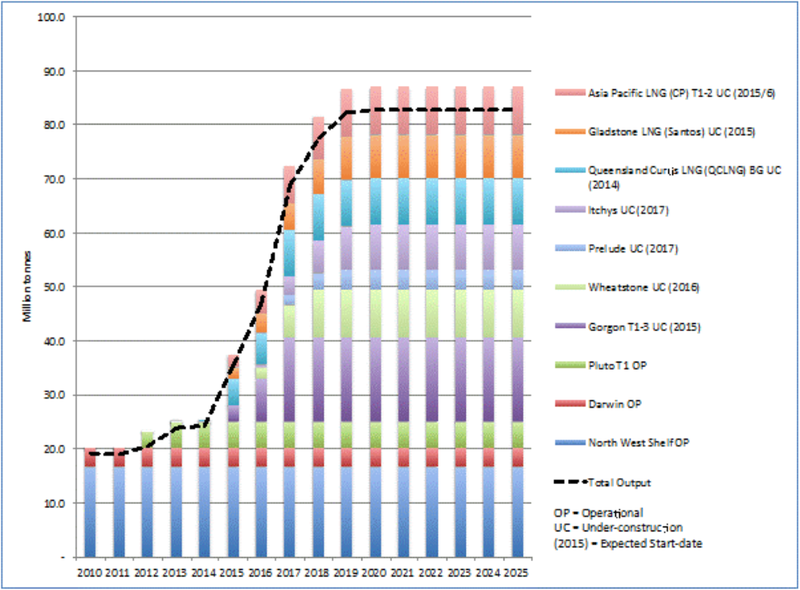 Add in significant expansions to North American LNG capacity, which will arrive a little later than Australian LNG, along with Russian pipelines to East Asia, and you have an emerging gas glut in the Asia-Pacific region. (Though admittedly many of the mooted North American projects will be looking doubtful after the oil price crash.) Thus it’s fair to say an ‘iron ore moment’ is looming over LNG from next year onwards. As I have argued in the past, Japan’s currency devaluation raises risks of a large-scale shift back to nuclear power, since the economics of importing energy is very poor when they have so much capital invested in a cheaper alternative. Prime Minister Shinzo Abe favours restarting the reactors, but public opinion remains largely hostile to this, given the Fukushima disaster. Japan’s snap election on December 14 could therefore turn out to be of considerable importance to the fortunes of Australian LNG; a strong mandate for Abe would likely see him press ahead with reactor restarts, adding more pressure to LNG spot prices. Of course, Australian LNG is mostly sold on long-term contracts linked to the oil price, so concerns around an emerging LNG surplus are academic right now, what with the collapse in oil. The latest hit came last night after OPEC conceded it has no plans to cut production in the face of lower prices. This represents a momentous shift in the dynamics of the oil market, with volatility appearing to be the new normal. In the short-term, many analysts believe $60 is in play, meaning utter carnage for Australia’s gold-plated LNG projects, which are all among the most expensive in the world. In any case, LNG is not going to provide much of a boost to the economy once it starts leaving our shores in record volumes, even if the oil price does rebound next year. Employment will be much lower in the operational stage than during the construction phase, and the squeeze on east coast gas supplies will hurt local industry. The only real positive effect will come via higher tax receipts, and obviously these are looking fairly lean now. Iron ore has been bludgeoned over the last month, notwithstanding more positive price action over the past couple of sessions. 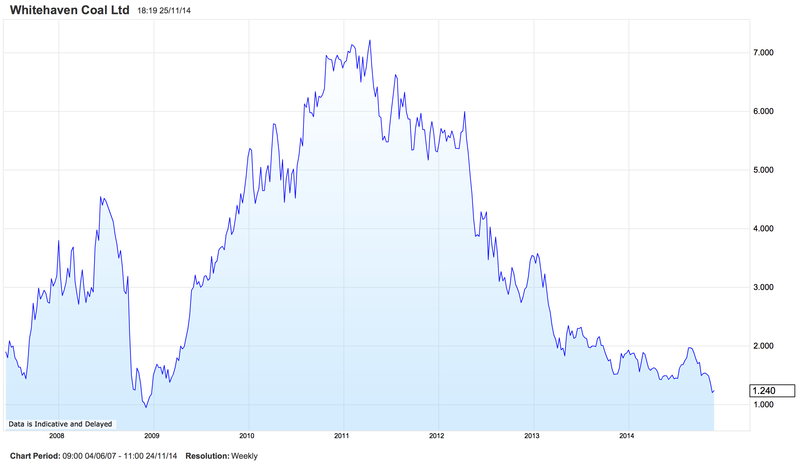 $80/t has since crumbled and we’re presently sitting at $70/t (Qingdao port price). The ‘further declines’ I expected to arrive early next year came ahead of time, the reason being an absence of seasonal restocking activity, which I discussed here. The market got briefly excited about an interest rate cut from China’s central bank last week, but that’s faded quickly. The last couple of sessions in China have seen strong buying both steel and iron ore, which could extend a bit further, but the fundamentals for both remain so poor that it’s hard to see a pronounced rebound into the year’s end. Iron ore is the main drag on the Australian economy today. Over the next year declining mining investment will probably assume that primacy, but what Australia is going through right now is quite simply a monstrous terms of trade bust, one of the biggest and baddest in our history. Without large reductions in supply, it’s likely we’ll see spot iron ore near $50/t by the end of next year. Thus, unless we get a full-blown resumption of the Chinese credit and property booms, and soon, the situation with iron ore makes it very hard to see the RBA hiking rates with the next move. The iron ore slump (-47% this year), has mostly been about the huge expansion in supply and the endurance of existing high-cost production, especially in China (the failure of Chinese steel demand to continue rising inexorably is the other important aspect). 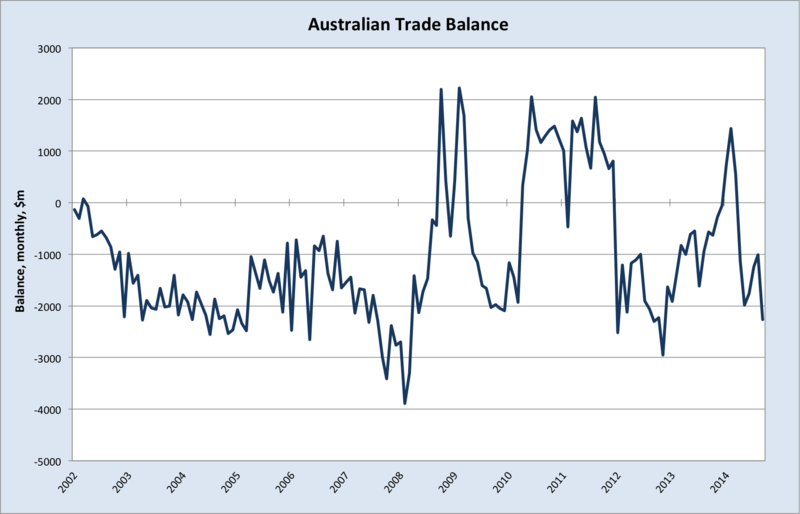 Much of this new supply has come out of Australia, hence our trade balance has not deteriorated too severely thus far. There will likely be further pressure on the trade balance over the next year, although I don’t expect the headline figure to be all that bad, owing to even more iron ore out of the Pilbara and the ramp up in LNG exports. This will be of little comfort, mind you, since higher volumes are of secondary importance when set against corporate profits, which are taking a beating in both sectors. Here’s the most recent terms of trade chart (Q3 national accounts arrive next week). Once recent falls in spot prices flow through to contracts, the terms of trade will be approaching the nadir of 2009. It will be a brave or desperate RBA that hikes interest rates in the midst of a terms of trade bust such as the one we are in the grip of. The Chinese economy continued to slow in October, emphasising why the government has lately shifted policy towards a more stimulatory footing. Industrial production, fixed asset investment and retail sales growth rates all registered falls from the previous month (charts from China’s National Bureau of Statistics). As I outlined in a post on China a few months back, investment levels grew to account for an unsustainably high proportion of GDP following the financial crisis in 2008. Why are very high levels of investment a problem? Investment is intended to raise output of goods or services in the future. If too small a proportion of an economy consists of consumption, then it risks insufficient demand for the extra goods and services produced by all that investment, and therefore poor returns for investors. When high levels of investment have been been funded by a massive expansion in credit, this can be calamitous. For this reason, the Chinese government has signalled its intention to rebalance its economy away from investment in ‘fixed assets’ (factories, infrastructure and apartment blocks) and towards domestic consumption. It is welcome then that retail sales have declined by less than fixed asset investment over the past year, and that the services sector has expanded more rapidly than manufacturing, but there is still a way to go. The challenge is immense; according to government researchers, $6.8 trillion of wasted investment has been undertaken since 2009. All this spending has of course contributed enormously to Chinese GDP growth, and I simply cannot see how growth rates aren’t going to slow markedly over the coming years as this uneconomical investment binge works its way through the system. In response to soft data and the bleeding in the property sector, which is itself an automatic consequence of the restraints placed on credit growth, the People’s Bank of China (PBoC) cut interest rates on Friday, adding to the easing of mortgage lending rules in September. Although this move won’t turn the economy singlehandedly, if it is accompanied by a broader easing of credit conditions then some argue it could herald a lasting rebound in property and support demand for bulk commodities. I remain highly sceptical that Chinese policymakers are seeking to reboot the credit boom. Debt-to-GDP has soared to 250% this year, from 147% in 2008. Although other nations have higher debt levels, such a rapid build-up of debt is a big concern, especially considering that China isn’t nearly as wealthy as other nations with comparable debt ratios. Moreover, much of the investment spending this credit has funded is are not going to provide a sufficient return, and so the quality of the debt is rather poor. China’s policymakers seem to understand this. I believe they’ll be looking to limit the stress on borrowers as much as possible, without reigniting credit growth. In particular, the shadow (nonbank) finance sector looks to be well and truly curtailed. This, at any rate, is how I am reading the interest rate cut: the government wishes to establish a floor under growth, as far as its feasible, rather than blow the roof off again. When we remember that inflation has been trending down over the past 12 months, especially in the second half of this year, its clear that the recent interest rate cut is as much about reversing passive monetary tightening as it is active monetary loosening. With inflation low and falling, a cut was the correct decision. I am doubtful this move presages a return to the credit boom days, and in any case it would need to be truly enormous now to mop up the sheer scale of excessive capacity in iron ore. Chinese policymakers may yet ride to the rescue, but in spite of recent supportive measures, we have not seen policy shifts substantial enough to alter the bleak outlook for bulk commodities. 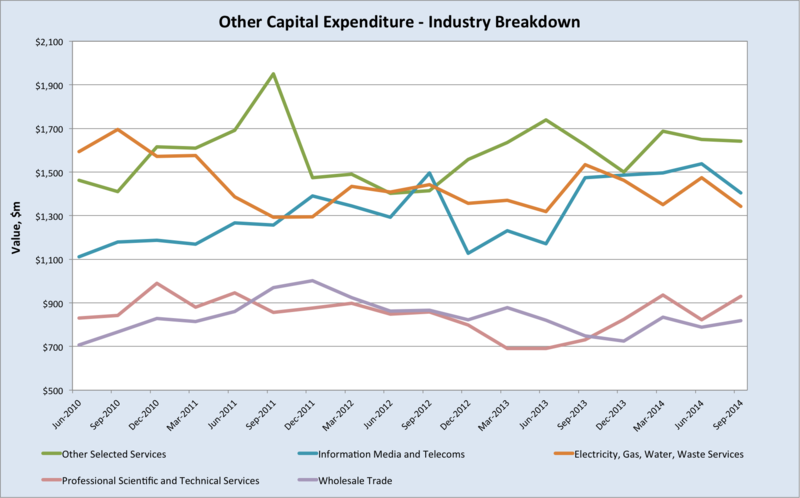 I covered yesterday’s capital expenditure data in detail here. 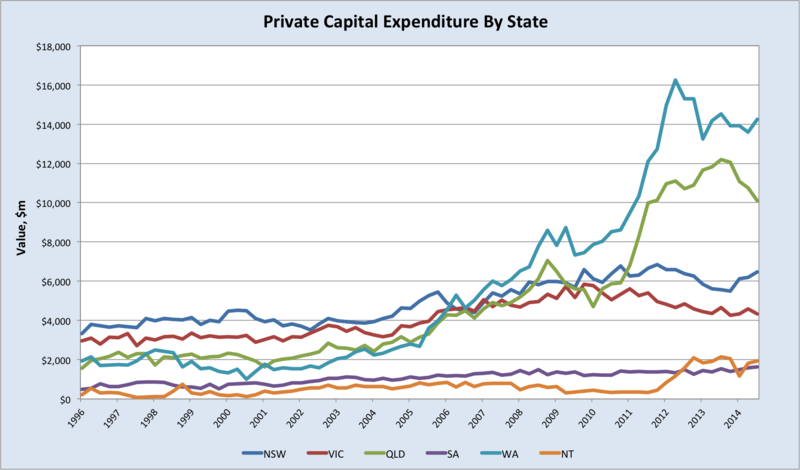 Capex has dodged steeper declines through resilient spending in WA and the Sydney property boom. Without further interest rate cuts, Sydney’s boom will start to cool within 6 months or so. And investment in WA is all about iron ore supply expansions, which hurt the terms of trade, and are likely to slow sharply next year as a result of the iron ore price crash (Fortescue’s announcement today is just the beginning). So although last quarter’s result was a positive, the future remains grim for capital spending. Spot iron ore is sitting at $70 at the moment, over 40% below what the WA government forecast. Next year it could well average around $60, half of what’s been forecast. 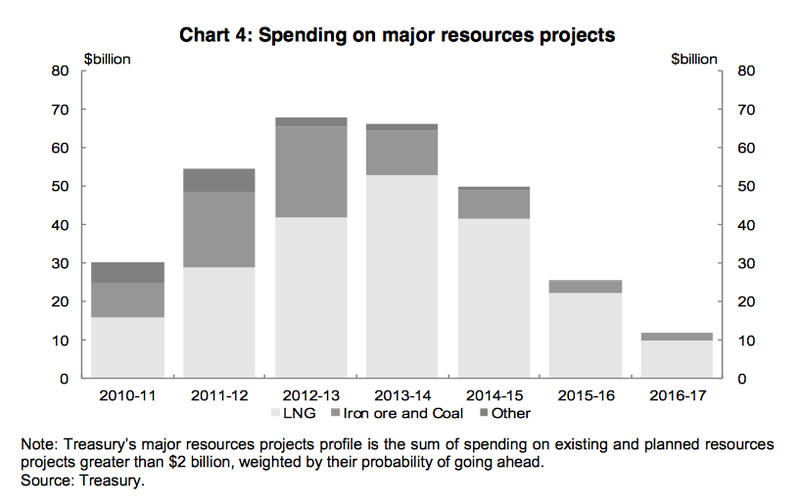 In the government’s own words, “General government revenue is also highly sensitive to the iron ore price, with iron ore royalties projected to account for 19.7% ($5.6 billion) of total revenue in 2014-15.” It estimates $49m in lost revenue for every dollar fall in spot iron ore. The lower Australian dollar will provide some minor respite for the budget, but not nearly enough. Stay tuned for the Great Western Austerity Drive next year. Although iron ore forecasts in the federal budget have not been anywhere near as aggressive as WA’s, the drop in prices has likely added around $10bn to the deficit this financial year, taking it to $40bn. Should the pain continue next year, it will obviously hit the budget even harder. The pressure will remain on the Treasurer to find savings that can pass the Senate, and these will no doubt be similarly popular to the ones announced in May. The ongoing fiscal retrenchment will likely dampen consumer sentiment in the coming months, making a consumer-led rebound a tougher ask. 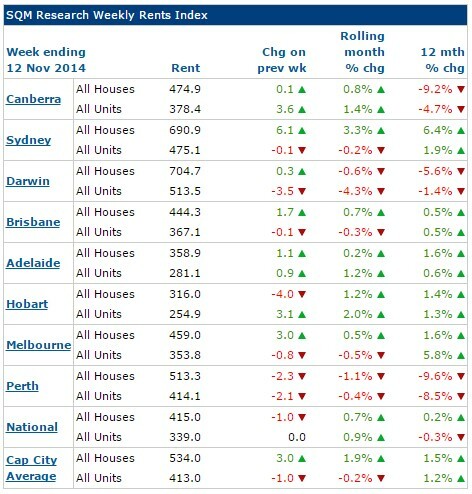 The housing sector moderated somewhat over the month, with Sydney and Melbourne diverging. 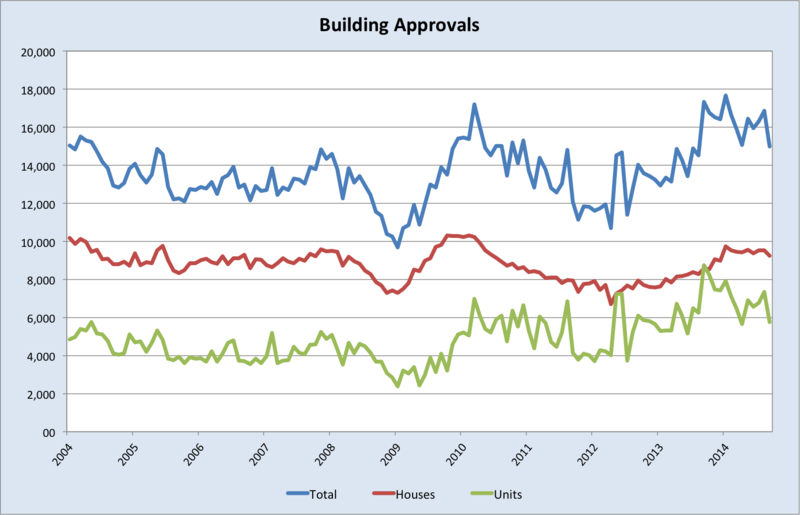 ABS data for building activity is only released quarterly, however the most recent monthly building approvals data registered a sharp drop of 11% from the previous month in seasonally adjusted terms. As you can see, the overall fall was largely due to the fall in approvals for units (apartments), which declined 21.9% between August and September. Since Melbourne is determined to become ‘Manhattan Down Under’, much of the apartment building surge has been concentrated in Victoria. Unsurprisingly then, September’s fall in national approvals was driven by Victoria. These data are fairly volatile, so one month doesn’t tell us a great deal. 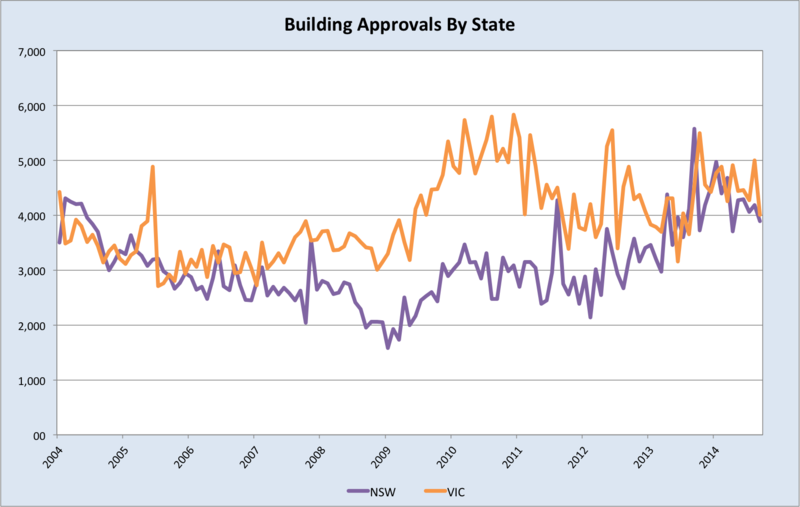 We’ll get the October data next week, and it will be interesting to see if approvals rebound. However, with rents growing far slower than house prices, increases in housing supply will steadily inflate valuations. Following the steep decline in interest rates between November 2011 and August 2013, the economic case for investing in houses improved substantially. But the consequences of this, namely house price growth far outstripping rental growth as investors piled in and supply increased, have eroded the attractiveness of property as an investment. Of course, Australian housing investors are not in it for the yield, they are in it for capital gains. Nevertheless, after-tax cash flow is important for justifying the borrowing required to speculate on houses, so tumbling yields will, in time, crimp investment demand. Valuations could go truly idiotic in the meantime, but eventually more cuts are going to be required to keep the party rolling. As I’ve mentioned, I can see it running for another 6 months or so, absent some external shock, before cooling on its own accord. If the structural downturn bites harder, property could easily roll over sooner. The RBA released credit data for October today, which showed an uptick in credit growth over the month. 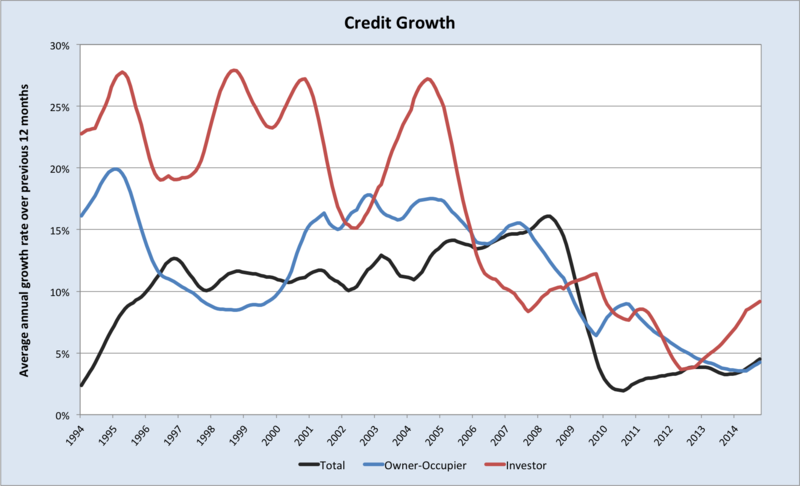 In comparison to the last speculative housing boom, overall credit growth has been subdued. It is important to recognize though that we’re beginning from a much higher base level of debt this time around. The jump in investor loans is therefore a concern, despite the growth rate being low historically. Also, with national income set to decline, expansions in risky borrowing are undesirable and potentially destabilising; cutting rates could fuel this fire. This leads some observers, such as those in the OECD, to argue that current activity in the property market is enough to warrant higher interest rates. Higher rates would certainly hit this sector, but they would also hit the economy very hard, right as it’s entering a pronounced structural slowdown. This would be madness, in my view, and its why I cannot see rates rising. There are other tools to slow housing, and the RBA and APRA are presently canvassing their options. At most, if property burns brighter into the new year, it will defer interest rate cuts. In time, the structural weaknesses of the economy will see property roll over. When it does, cuts to interest rates will follow quickly, if they have not already arrived. The Australian consumer is exhibiting less inclination to spend aggressively out of current income than during previous property booms. Job vacancies data last week showed labour demand in the non-mining sector continues to gradually improve, particularly in labour-intensive industries such as construction, health and retail. Alongside low interest rates and rising house prices, this should support consumer confidence and retail spending as we head into the Christmas season. In the near term, prospects for a boost in consumer spending going into the end of the year are not encouraging. So, ‘who really knows what consumers are thinking right now?’ , seems to be the conclusion. 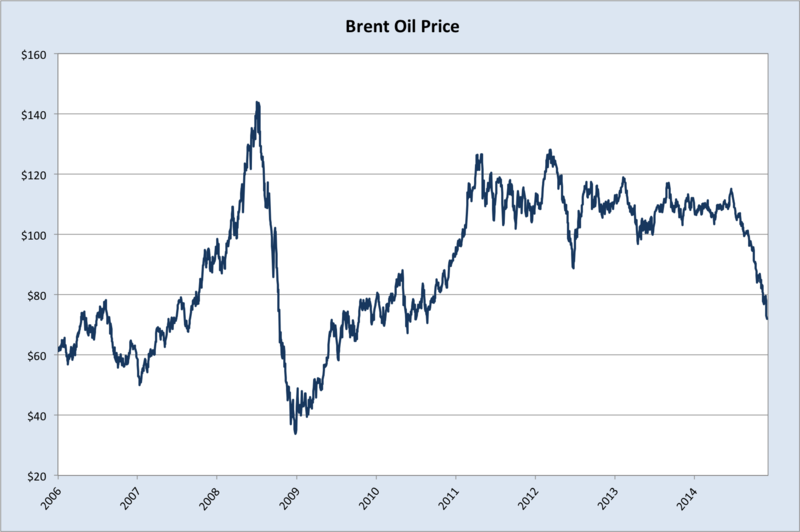 The large decline in oil prices could help sentiment if it ever feeds through to petrol prices. But the salient point, I think, is that as the terms of trade bust and investment downturn gather pace, and as public balance sheets deteriorate, it’s going to be increasingly hard for the consumer to remain so upbeat and willing to spend that he/she overrides this structural downturn. In any case, with national income falling, consumers will need to dig deeply into savings to deliver the jump in spending required to lift interest rates. As long as the savings ratio remains elevated, consumption will not rise strongly enough to overwhelm weakness elsewhere. 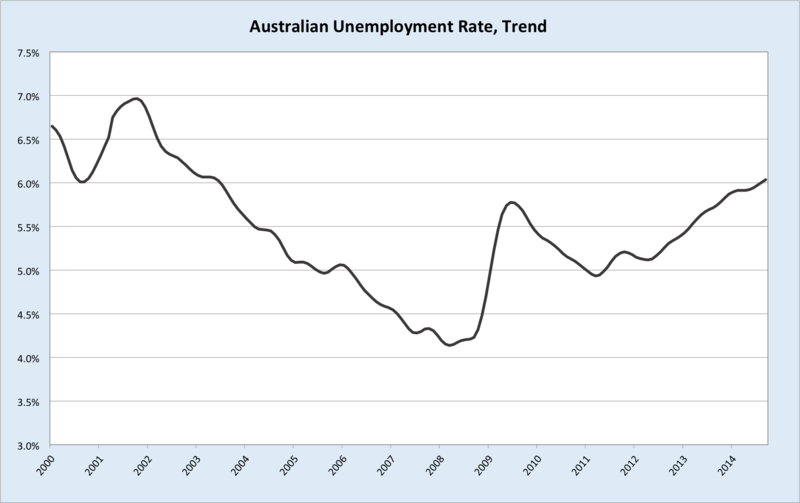 The Australian Bureau of Statistics’ labour force survey has suffered well-publicised issues in recent months, so the official data is not as reliable as it ought to be, but the trend in unemployment remains up. 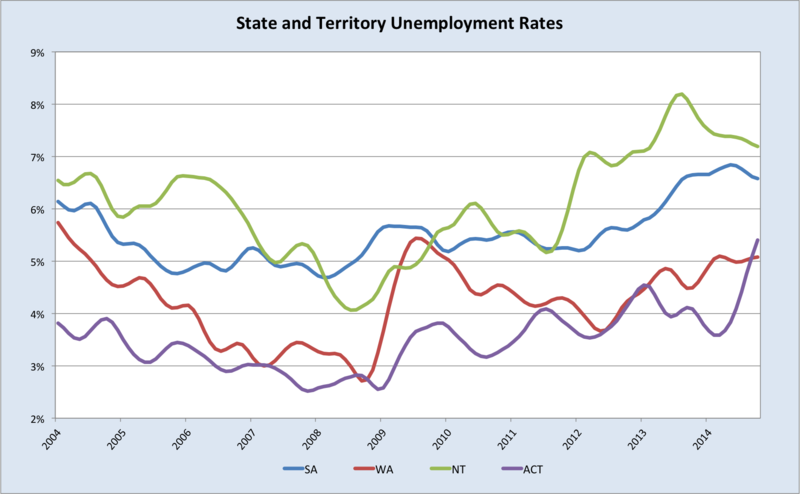 Public sector layoffs in the ACT and Queensland, along with the beginning of the LNG investment wind-down in the latter, are hurting employment in those states, and will continue to do so. Strong population growth is driving the Victorian economy at present, instead of the other way around. While this works at the aggregate level, with overall state demand rising, it’s meant that unemployment has trended higher. 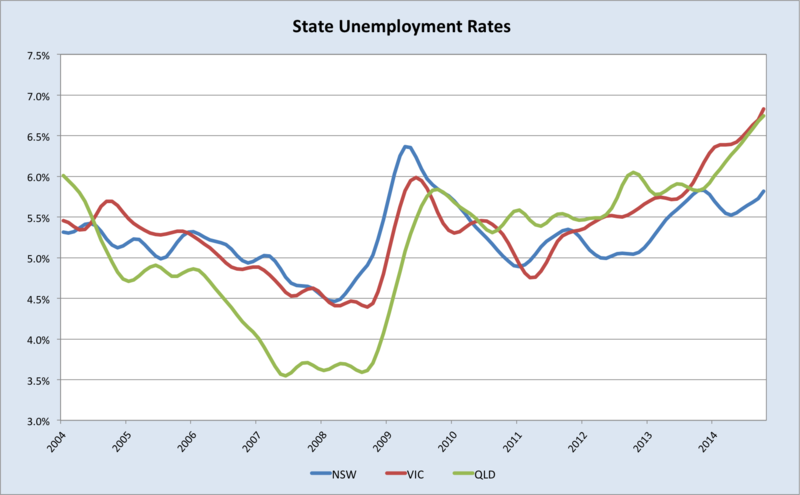 Also troubling is the stubborn rate of unemployment in NSW, in spite of its property bonanza over the past couple of years. With the most spritely phase of the boom likely past, it’s difficult to see where a sustained improvement in employment will come from. 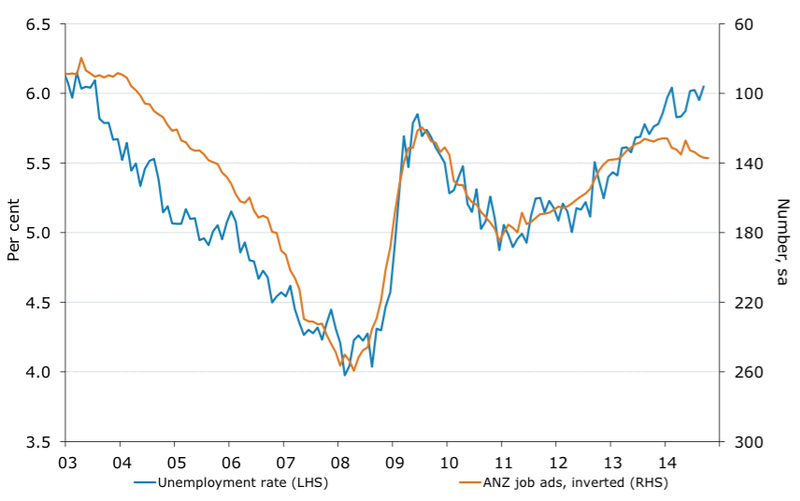 The modest improvement in ANZ job ads in October is an encouraging sign that the pick-up in labour demand is continuing. In our view, this should feed into better employment growth outcomes and see the unemployment rate stabilise. As you can see on the second chart, there’s been a clear divergence in the past 18 months between job ads and the unemployment rate. This is historically unusual, and indicates either that the labour market is ready to turn, as ANZ’s economists believe, or that the economy is in the grip of a highly anomalous structural adjustment that will see existing jobs shed faster than new ones become advertised. Most of the uptick in job ads will be connected to the frothy segments of the NSW and Victorian property markets. As I’ve made abundantly clear, I am sceptical that this froth will last for much longer. As discussed in the previous interest rates update, there’s little in the way of inflationary pressures for the RBA to worry about. Although the Consumer Price Index had bumped up against the top of the RBA’s band (2-3%), this was almost entirely driven by the depreciation in the Australian dollar last year, and therefore not something the RBA needed to counter with monetary policy. 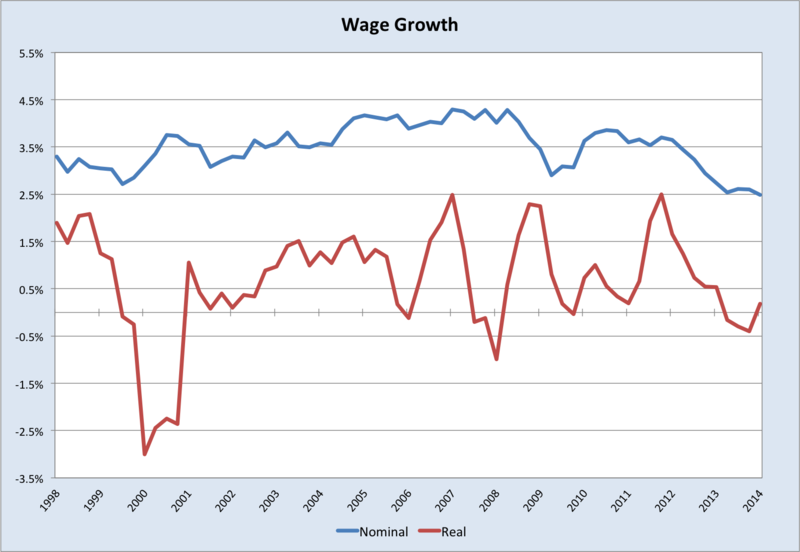 Nominal wage growth is currently the lowest on record, though the ABS only has a wage price index reaching back to late 1990s. However, Australia experienced far higher inflation in the preceding decades, so current levels are likely to be lowest in a very long time. Real wage growth is also low, flirting with negative rates. In short, there is nothing in the prices of labour or goods and services to warrant monetary tightening. As I have written previously, a large and sustained drop in Australia’s real exchange rate is critical to achieving genuine economic rebalancing (as opposed to a short-term cyclical sugar-hit). Therefore, a deep fall in the exchange rate could defer or even eliminate the need to for the RBA to cut rates. And indeed, there’s been a welcome decline in the Australian dollar in the last few weeks. These moves have been driven in part by a gradual recognition that rates will need to fall in Australia. What this means is that if the RBA does not eventually cut rates, or fails to signal that they will, the Aussie dollar’s drop will be probably limited. I can see it moving to .8000 now without too much trouble, on a technical basis it is looking quite sickly, but I cannot see it falling hard enough to negate the need for rate cuts. It remains very difficult to see the RBA hiking rates in light of the ongoing structural headwinds. The cyclical boosters are still supporting activity, but by their very nature these growth drivers require continual monetary easing to be maintained in the current environment. Therefore, if rates do rise, the Australian economy will quickly lose its only propellants, and this will necessitate lower rates again in fairly short order. I continue to expect rates to remain on hold for another 3-6 months before the RBA cuts in Q2 next year. This entry was posted in Uncategorized and tagged Australia, Australian dollar, China, interest rates, investment on November 28, 2014 by MJV. The results of the private capital expenditure survey for the September quarter were released by the ABS this morning, showing a seasonally-adjusted .2% rise, in volume terms, on the June quarter. This solidly beat expectations for a 1.9% drop. In dollar terms, capital spending by the mining sector dropped 3% over the quarter and manufacturing fell 1.3%, with these falls offset by a 5.6% jump in ‘other selected industries’. 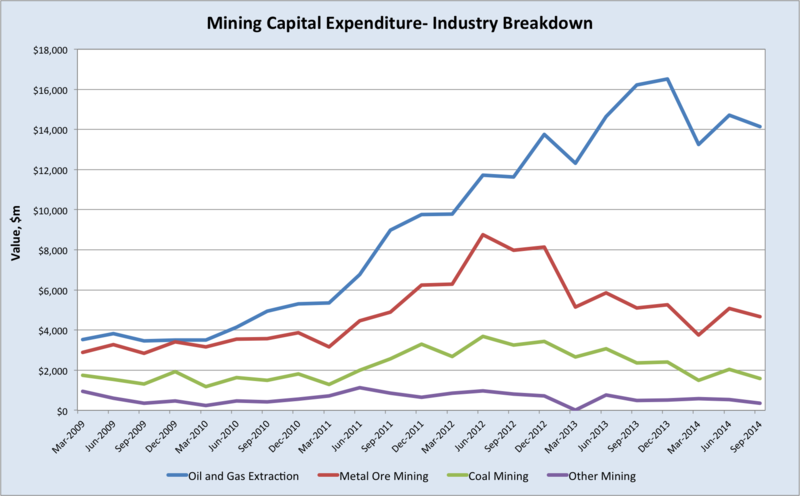 Total capital spending was down 4.6% ($1894m) on the same quarter last year, mining was -14.2% ($3475m), manufacturing -10.5% ($253m), and ‘other selected industries’ +12.8% ($1833m). The main driver of capital spending by ‘other selected industries’ over the past year has been the ‘rental, hiring and real estate services’ industry grouping, which has risen by 40% and contributed $838m of the $1833m in additional spending by that sector. Contributions have also been made by businesses in ‘retail trade’, ‘construction’ and ‘financial and insurance services’. Those industry groupings cover businesses benefiting from the last monetary easing cycle and the consequent boom in house prices. Unsurprisingly, seeing as it’s the nucleus of the boom, NSW has accounted for over half the increase in capital spending by ‘other selected industries’ over the past year. Here’s the division of total capital spending by state. Evidently, the cyclical boost emanating from the Sydney property sector and the resilience of mining investment in WA have cushioned the overall blow to capital spending in the past year. The latter of those points is important. If capex holds up in WA, it’ll come at the expense of the iron ore price, since capital spending in WA is almost entirely constituted by iron ore capacity expansions. Manufacturing is all but dead so we can ignore that until we see the dollar fall 20-30% in real terms. Without further cuts to interest rates, the cyclical upswing in NSW is likely to run out of puff over the next 6 months or so, in which case I wouldn’t be surprised to see expected spending by ‘other selected industries’ moderate somewhat by the time the full year’s spending has been recorded. Activity in this interest rate-sensitive space reflects the RBA’s strategy for ‘rebalancing’ the Australian economy as the resource sector slows. This is bubbly economics: papering over a structural downturn with a cyclical upturn in borrowing, asset speculation and consumption. The US famously tried this strategy after the tech wreck early last decade, and it ended up with a catastrophic housing bust. Thankfully, Australians have mostly kept their heads so far, and the bubbliest segments of the economy are confined to Sydney property speculation and manic Melbourne apartment building. Credit is not growing too rapidly and household savings rates remain reasonably healthy (bearing in mind, of course, that households are already heavily indebted). Nevertheless, the bubbly segments have lately caused enough consternation within the RBA and APRA for these institutions to move forward with ‘macroprudential regulations’, specifically aimed at reducing macroeconomic risks in the property sector and banking system. 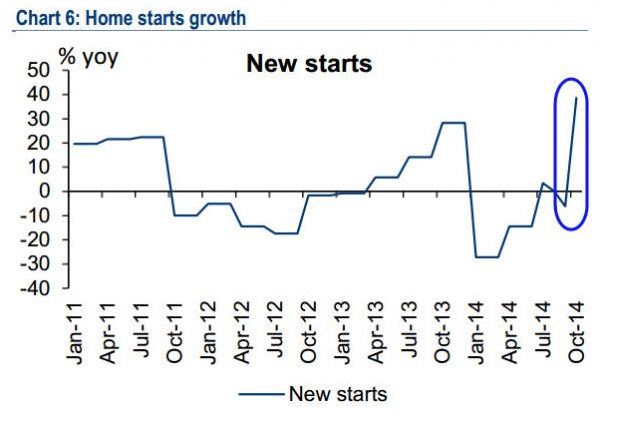 Despite having cheered it on, the RBA finally grew wary of the housing beast. It remains to be seen how stringent macpru ends up being in Australia, but it is a welcome move. Some commentators will be inclined to regard this upturn in housing-related activity as healthy rebalancing, but in my view a structural downturn needs a structural remedy, not a temporary sugar hit. We need a lower real exchange rate and productivity-enhancing reforms and infrastructure spending to boost investment in non-mining tradable goods industries. Until we get that, it’s hard for me to get excited about any purported ‘rebalancing’. As to mining investment, there’s little doubt that we’re going to see it deteriorate sharply over the next two years, particularly given the recent carnage in iron ore and crude oil prices (which LNG prices are linked to). The BREE recently published its forecasts for mining projects. 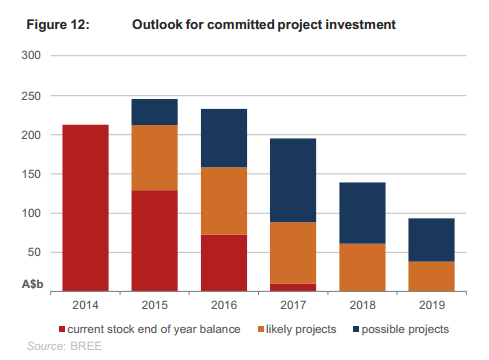 It’s safe to say that ‘possible projects’ are extremely unlikely, and also that many ‘likely projects’ will fail to break ground as well, without big rebounds in oil and iron ore prices, or a sharp fall in the Australian dollar. This entry was posted in Uncategorized and tagged Australia, capex, housing boom, housing market, LNG, mining investment on November 27, 2014 by MJV. Reigning in a credit bubble before it bursts is a mightily taxing task. China’s authorities have been holding firm admirably in the face of China’s cooling economy, but the chilliest property market in a long while has at last provoked a response: tonight the People’s Bank of China cut benchmark interest rates for the first time since July 2012. The one-year deposit rate was lowered by 0.25 percentage point to 2.75 percent, while the one-year lending rate was reduced by 0.4 percentage points to 5.6 percent, effective tomorrow, the People’s Bank of China said on its websitetoday. The reduction puts China on the side of the European Central Bank and Bank of Japan in deploying fresh stimulus and contrasts with the Federal Reserve, which has stopped its quantitative easing program. Until today, the PBOC had focused on selective monetary easing and liquidity injections as China heads for its slowest full-year growth since 1990. Aggregate financing in October was 662.7 billion yuan, the central bank said Nov. 14 in Beijing, down from 1.05 trillion yuan in September and lower than the 887.5 billion yuan median estimate in a Bloomberg survey of analysts. New local-currency loans were 548.3 billion yuan, and M2 money supply grew 12.6 percent from a year earlier. As that article notes, credit growth in October was weak despite the widely-publicised shift to looser mortgage conditions in September. This change in policy stance provoked an avalanche of new property starts, which will in turn keep the pressure on prices. This interest rate cut does look entirely appropriate in the context of China’s economy today, and to be honest there was little choice for the PBoC given the extraordinary depreciation in the yen and signs that the ECB could be joining the party before too long. (See this post for more on that.) The economy has continued to weaken in the past few months, and although it’s too early to judge the effects of recent changes to mortgage lending rules, it does seem that more needs to be done to arrest the decline in property prices, especially seeing as the market is now almost certainly structurally oversupplied (a point that was less clear in 2012, when property last turned down). As I’ve emphasised many times on this blog, one of the trickiest things about forecasting Australia’s short-term outlook is the ever-present Chinese policy enigma. Many commentators are eager to point out that China’s slowdown this year, with its knock-on effects to Australia’s key export commodities, has been purposely engineered by its masterly policymakers. Thus, when things look like slowing down too much, all that needs to be done is a slight easing off on the brakes and a light tap to the accelerator, and all will be well. China’s total debt reached 251 percent of gross domestic product as of June, up from 234 percent in 2013 and 160 percent in 2008, according to Standard Chartered Plc estimates. Fortunately, they seem to have a firm grasp of their failings in this regard, and policy has been crafted this year with a clear objective of credit rationalisation: slow the overall rate of credit growth, hit shadow banking hard, and take the froth out of property prices. The great challenge of course is that China’s economy has grown hugely dependent on this model. 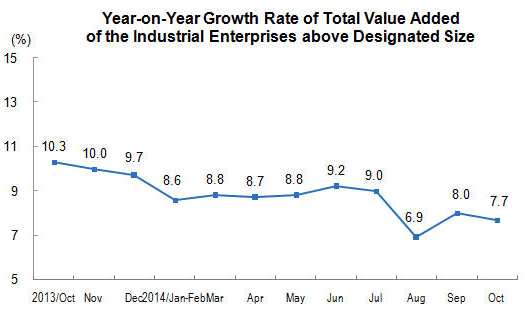 As credit growth slows and questionable investment spending is restricted, the economy slows. Along with the changes to mortgage rules in September, this interest rate cut sends a clear message that China’s authorities have become uncomfortable with the resulting hit to the economy from their credit tightening, and are prepared to tolerate looser conditions. So, is this enough to fundamentally shift the outlook for the Middle Kingdom, and with it Australia’s? I’m sceptical that this cut alone will be enough to reignite the credit binge necessary to produce a large upswing in activity, more likely it’s intended to help the economy glide towards slower growth rather than crash. And I wouldn’t be jumping to the conclusion that the government has abandoned its commitment to credit rationalisation. My view is that authorities are looking to place a floor under growth, rather than blow the roof off again. I know I’ve said it a few times in the last couple of months, only to see the market cruelly mock my optimism, but I’ll try again anyway: I won’t be surprised if this move from the PBoC offer respite to our beleaguered iron ore miners by seeing off a new low in spot this year. By don’t expect a stomping rebound, since nothing has fundamentally changed in the market, and do expect a resumption of pain next year. AUD has been heavily bid since the announcement, up about a cent against the USD, as have equities. This entry was posted in Uncategorized and tagged China, iron ore, property market, the People's Bank of China on November 21, 2014 by MJV. Are we in danger of becoming a great country? When I put the question to politicians and officials in interviews for this book, the majority response is to laugh or sigh. Be that as it may, just because Australian politicians and officials weren’t seized by a collective great power delusion doesn’t mean that Australian Exceptionalism was absent from our policymaking mindset; far from it. This sense of exceptionalism manifested itself in a constant tendency to overestimate the durability of the mining boom, which has lasted all the way through to the present day. While the Bureau of Resources and Energy Economics has traditionally been the main offender, the most risible delusion today belongs to the Western Australia government, which has forecast iron ore at $122 for 2014-15. 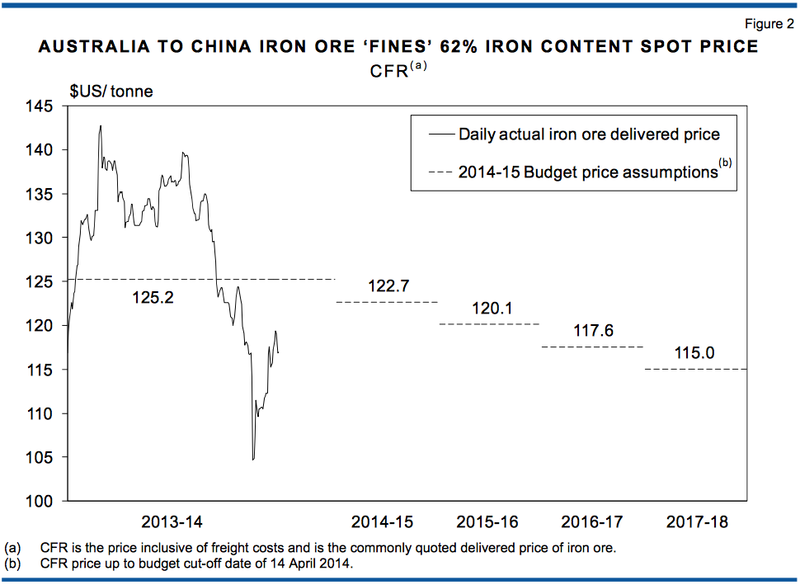 So far iron ore has averaged $86 this financial year, and is currently sitting at $70/tonne. There’s been cascade of revisions to iron ore price forecasts lately, and Chinese futures are pricing spot at close to $60 by May next year. Plainly, the WA budget is in big trouble. Although federal budget forecasts have been less sanguine, Canberra is still facing an unpleasant shock; as I’ve argued since this blog’s inception, the public balance sheet is under far greater stress than is typically recognised, mainly because iron ore is in significantly more trouble than has typically been acknowledged (until very recently, of course, when the market made it impossible to deny). The idea that our prosperity would be underwritten by demand for our minerals and energy has had a pervasive effect on politics over the past decade, and led to what Professor Ross Garnaut dubbed the ‘Great Complacency’. This argument is a noticeable departure from the one advanced by Megalogenis, which I covered in the previous post. This is actually quite odd, seeing as he agrees with most of the particulars but arrives at a completely different conclusion. The thrust of the ‘Great Complacency’ argument is that there weren’t sufficient adjustments made to fiscal policy to reflect the transient nature of the terms of trade boom. We can see this plainly enough in the rather pathetic fact that we’ve reached the denouement of a huge mining boom with a federal budget mired in structural deficit and a current account deficit that never even threatened to close (the current account balance is the trade balance plus net foreign income). Worse than that, the initial phase of the terms of trade boom, prior to the financial crisis, saw some of the largest current account deficits of modern times, as Australian households threw aside the old art of saving in the new millennium. This was the legacy of the housing frenzy, which peaked in 2003-04. It was also the period through which fiscal settings should have been much tighter, as corporate tax revenues started pouring in from the early stages of the boom. Alas, the Howard/Costello budgets were too generous, delivering tax cuts and expansions to various entitlement programs, which boosted overall spending in the economy. 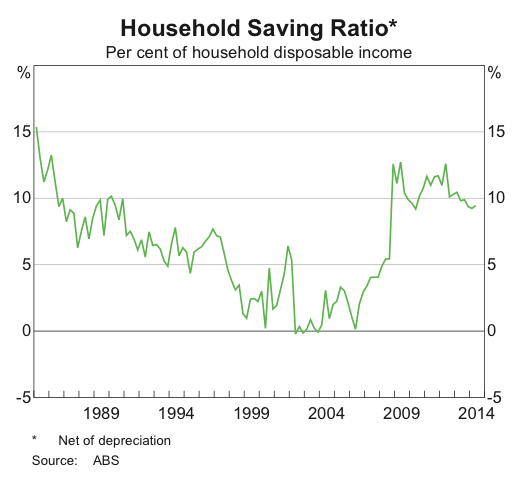 The combination of spendthrift households (at least until 2006, when the saving ratio began to rise), and a government eager to feed the habit, left the RBA with the job of leaning against the boom. This monetary tightening formed part a deliberate strategy for adjusting Australia’s economic settings in response to the terms of trade boom. There were basically three ways that Australian policymakers could have dealt with the boom: a) real exchange rate appreciation by domestic inflation, b) real exchange rate appreciation by currency appreciation, c) a forcible increase in national savings. (Or some combination of all three, of course.) Understanding which approach was adopted, why it was adopted, and what it entailed, helps us understand Australia’s current outlook. In this paper as in others it follows, commodity price super-cycles are thought of as broad-based, medium-run cycles corresponding to upswings in commodity prices of roughly 10 to 35 years. These are demand-driven episodes closely linked to historical episodes of mass industrialization and urbanization which interact with acute capacity constraints in many product categories—in particular, energy, metals, and minerals—in order to generate above-trend real commodity prices for years, if not decades on end. Significantly, this paper finds that fully 15 of our 30 commodities are in the midst of super-cycles, evidencing above-trend real prices starting from 1994 to 1999. The common origin of these commodity price super-cycles in the late 1990s underlines an important theme of this paper: namely that much of the recent appreciation of real commodity prices simply represents a recovery from their multi-year—and in some instances, multi-decade—nadir around the year 2000. At the same time, the accumulated historical evidence on super-cycles suggests that the current super-cycles are likely at their peak and, thus, nearing the beginning of the end of above-trend real commodity prices in the affected categories. Exactly what Australia has just gone through, in other words. 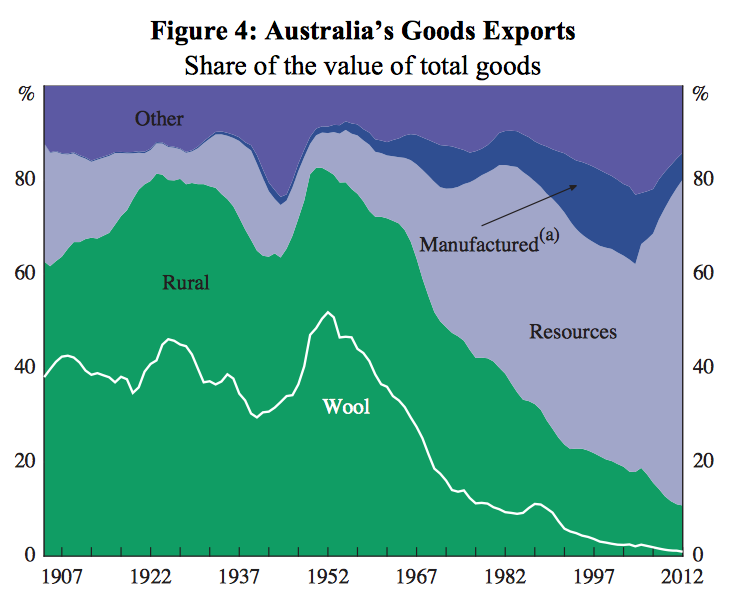 Primary resources account for the vast majority of Australia’s goods exports. 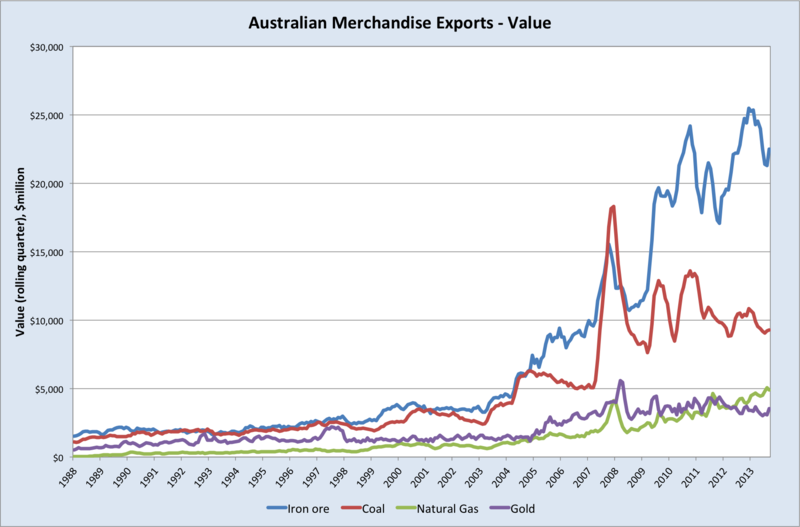 As a result, Australia has always been prone to commodity price boom and bust cycles. 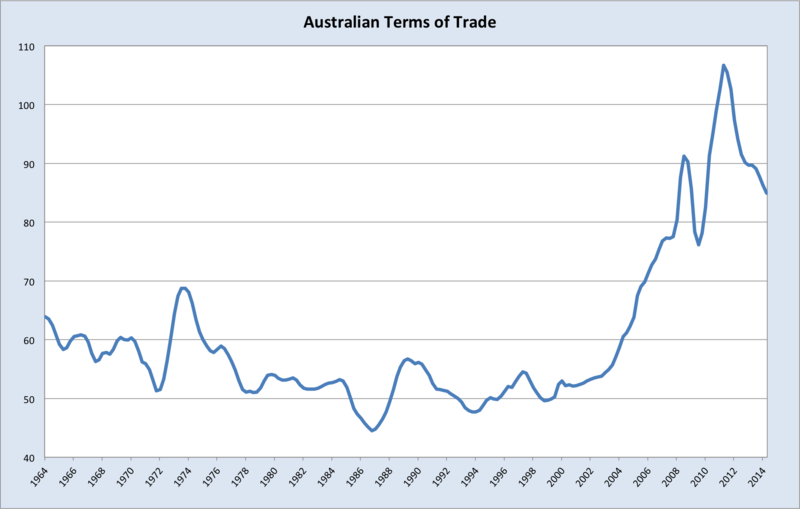 Terms of trade booms entail a significant rise in Australia’s national income, since we’re able to exchange the goods we export for more (or higher value) imports. We get richer. But most of us don’t sell iron ore on the world market, so how does the soaring iron ore price impact those of us who aren’t directly remunerated by the iron ore industry? There are a few channels through which this can occur, but essentially it’s through an appreciation in the real exchange rate. The exchange rate that gets quoted to you when you travel overseas is the nominal exchange rate, which doesn’t necessarily tell us much about the relative purchasing power across different countries (think of nominal as ‘in name only’). This point can be illustrated by way of a simple, stylised example: Suppose Australia’s nominal exchange rate is fixed against the US dollar at parity, but Australia has very high inflation, say 100% annually, whereas US inflation is zero. In a year’s time, you’ll (hopefully!) be getting twice as many Australian dollars in your pay check each week. The prices of haircuts and beers and electricity in Australia have also all doubled, so in real terms you’re no better off buying things in Australia. But you can still exchange each Aussie dollar (of which you now have twice as many) for one US dollar, since the rate is fixed at one-for-one. And since inflation is zero in the US, the prices of haircuts and beers and electricity haven’t changed at all. So if you exchange your Aussie dollars for US dollars, you can head over to the US and buy twice as much stuff! Despite there being no change the nominal exchange rate, Australia’s real exchange rate has appreciated. An appreciation in the real exchange rate has accompanied all of Australia’s terms of trade booms. When the terms of trade enters an upswing, additional income starts flowing into the economy, raising profits and salaries in affected industries and boosting government revenues. Unless the government purposely restricts spending by tightening the budget, this increase in income flows into the rest of the economy. Firms raise investment and households consume more. 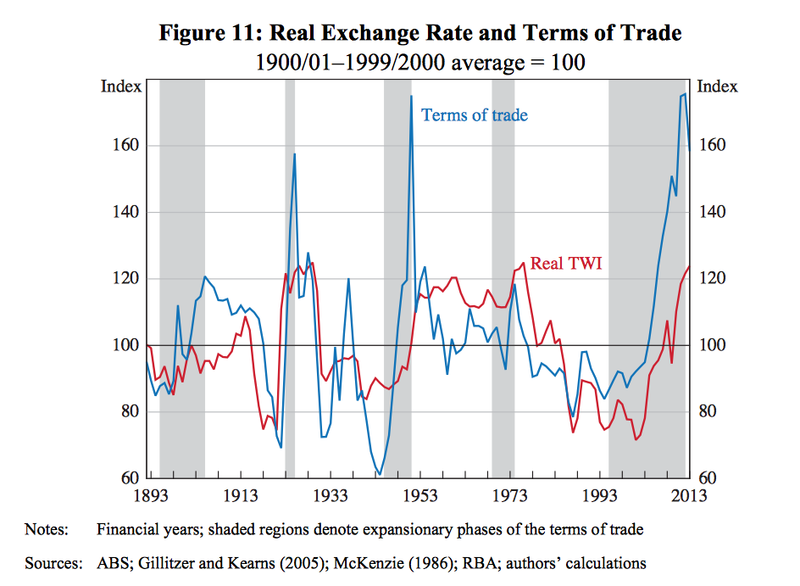 Until 1983, when Keating floated the dollar, Australia’s nominal exchange rate was fixed (well, tightly managed). If the nominal exchange rate is fixed, then there’s no automatic mechanism to make life harder for trade-exposed industries that are not directly benefiting from the terms for trade upswing, so firms aggressively compete for scarce labour, driving wages higher. As spending and income rises throughout the economy, inflation rises. Thus, as I described above, Australia’s real exchange rate rises. This is why it’s commonly agreed that one of the central achievements of the most recent terms of trade boom has been the prevention of an inflationary breakout (see CPI chart above for comparison to past booms). Instead, since it was accepted that the real exchange rate had to rise, the nominal exchange rate did the heavy-lifting, allowing inflation to remain in check (or ‘anchored’, in econospeak). That is, instead of the Australian dollar being fixed against other currencies, it traded freely, and rallied very strongly indeed. Prior to the current terms of trade cycle, the RBA adopted an inflation-targeting framework, with the goal of keeping consumer inflation between 2 and 3 per cent on average over the medium term. This framework has provided a clear nominal anchor which, together with changes to the structure of the labour market described in Section 4.5, limited the feedback of the boom to economy-wide prices and wages. 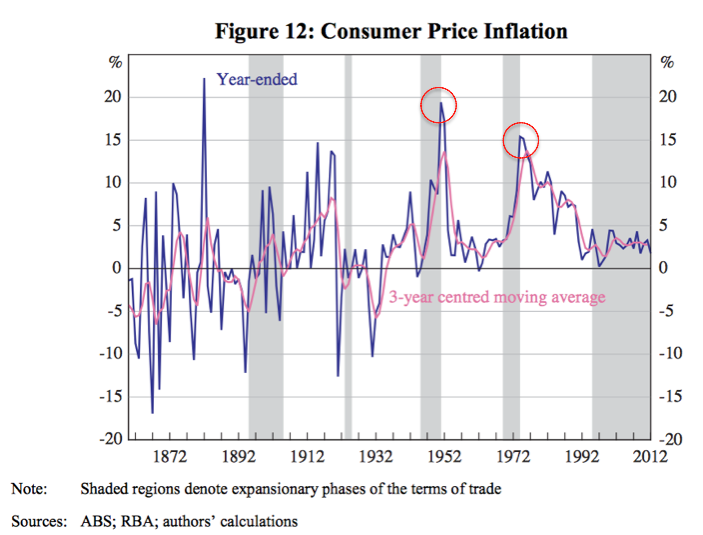 Notwithstanding the very significant rise in the terms of trade in the current episode, inflation has been well contained, especially when compared to the experience of the 1950s or 1970s. The floating exchange rate and inflation- targeting framework has also provided the RBA with the flexibility to maintain an accommodative stance of monetary policy more recently to support domestic demand since the terms of trade has started to fall. Australia’s freely floating exchange rate has allowed a real appreciation to occur in response to the 2000s mining boom without the adjustment coming through high inflation, as occurred under the less flexible exchange rate regimes of the 1970s and early 1980s. The surge in mining export receipts in the late 1960s and early 1970s generated strong domestic demand and placed upward pressure on the exchange rate. The Government kept the exchange rate fixed, building foreign reserves and allowing the domestic money supply to grow at an annual rate of over 20 per cent in the early 1970s (Figure 25). When the Government finally revalued the exchange rate in late 1972 and 1973, it was too late to restrain inflation, which had drifted up from around 3 per cent in the late 1960s to 7 per cent in 1971. In contrast, during the 2000s, the floating exchange rate began appreciating as the global economy recovered from the 2001 recession, and appreciated further over the remainder of the decade as the terms of trade continued to rise. Furthermore, when commodity prices moved sharply in 2008/09, the exchange rate adjusted to cushion the shock to the economy. Overall, the higher exchange rate has helped to offset the expansionary effect of the increase in mining export receipts and investment. I’ll call this Plan B: still allow the real exchange rate to rise in response to the terms of trade upswing, but keep inflation anchored, prevent a wage breakout, and leave it to the nominal exchange rate to rise and fall in accordance with the economy’s needs. This entails is a shrinking of various other tradable-goods sectors in the economy, which can’t compete internationally when the Aussie dollar is so strong, to ‘make room’ for the booming resource sectors. As the nominal exchange rate rises, Australians get richer in real terms and demand more imported goods, which are cheaper relative to locally-produced goods. Consequently, trade-exposed sectors and businesses which aren’t benefiting from the boom start to struggle; they reduce their demand off workers and curtail new investment. This process reduces inflationary pressures in the economy during the upswing. What makes a nominal exchange rate appreciation so attractive is the comparative ease with which the economy will adjust to the downswing in the terms of trade, at least in theory. As the terms of trade decline, and drag down national income with it, the Australian dollar will lose value. As the Australian dollar loses value, sectors which were getting squeezed by the booming resource sector will see an improvement in demand for their products, and this will support business investment and employment. So we’ve arrived at one of the fundamental points of the Australian economy today: With the terms of trade bust and the resource investment wind-down gathering pace, the Australian dollar must fall substantially from its current level. Most people I think probably appreciate this intuitively. However, we are talking about a very big adjustment indeed, 20-30% lower than where the Aussie dollar is trading presently, at least. If this nominal exchange rate depreciation is not realized, if the Australian dollar does not lose value against the relevant currencies of trade partners and competitors over the next couple of years, unemployment will rise significantly. Of course, one way or another, it almost certainly will happen. It’s a matter of timing. The Aussie dollar will fall when it becomes clear than Australian interest rates are going a lot lower and most likely staying there for an extended period. Therefore, the longer the RBA waits, the worse the employment situation will get. But rising unemployment is itself one of the most important indicators watched by the RBA, so in that sense the bank will be forced to act sooner or later. Whether the board is proactive or reactive in this instance is the main question. Sounds pretty simple, doesn’t it? 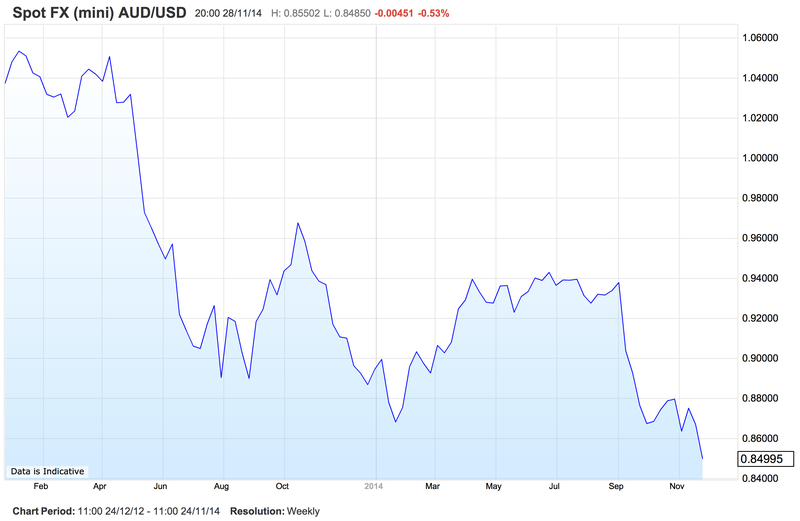 All the Australian dollar needs to do is fall precipitously and the economy will be fine! Would that it were that easy. 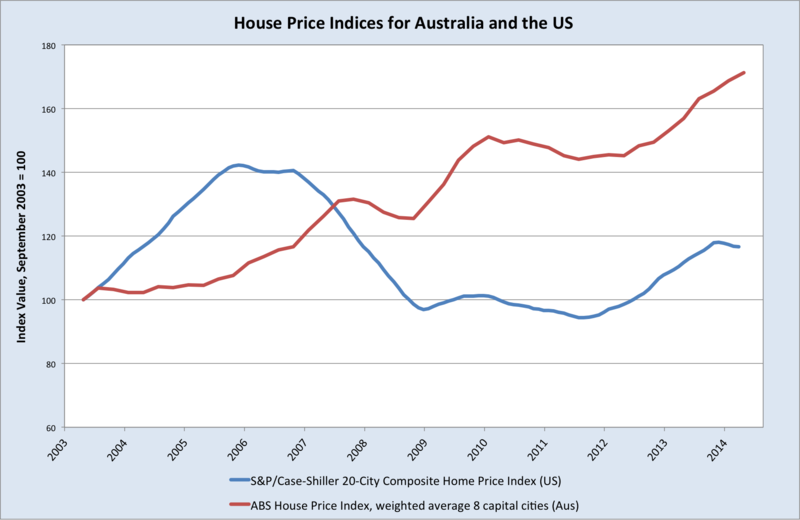 Sadly the Australian case is complicated by the situation in the housing market. 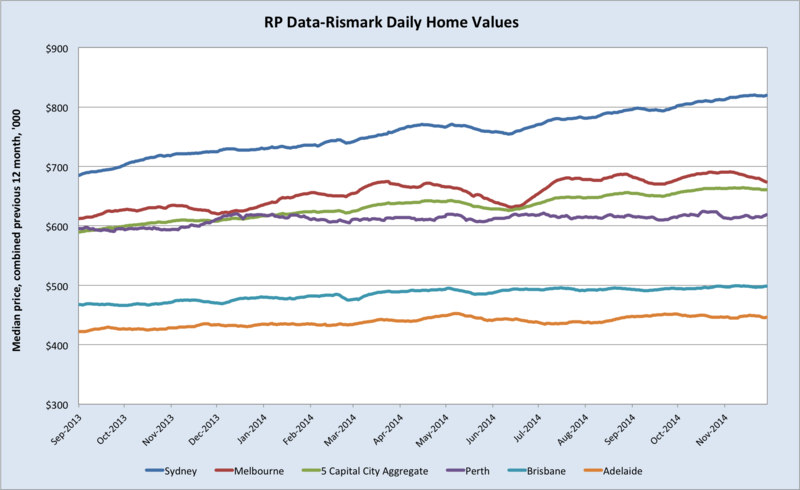 Although the economy needs lower rates to bash the currency (there are other options but the RBA is loath to countenance these), this action invariably provokes a rapid and destabilising response in the housing market. In the next post I’ll run through the challenge associated with the housing market, and why it complicates the real exchange rate adjustment. So far we’ve seen Plans A and B for responding to the terms of trade boom. Each entailed a significant real exchange rate appreciation, by domestic inflation and nominal exchange rate appreciation, respectively. But did the real exchange rate have to rise so strongly in response to the upswing in the terms of trade? The current account balance is the difference between domestic demand for goods and services and domestic supply (you need to add in net foreign income earned in the period as well). As such, a country running a current account deficit is purchasing more goods and services than it is producing. To do so, it must borrow the difference from international lenders (or sell assets to international investors). A country that is borrowing more from than it is lending internationally, is running a capital account surplus. Together, the current and capital accounts make up the balance of payments. One might be excused for assuming that Australia would have run significant current account surpluses during the biggest boom in exports in over a century. But in fact, as my chart above illustrates, at no stage during the boom did Australia notch up a surplus. 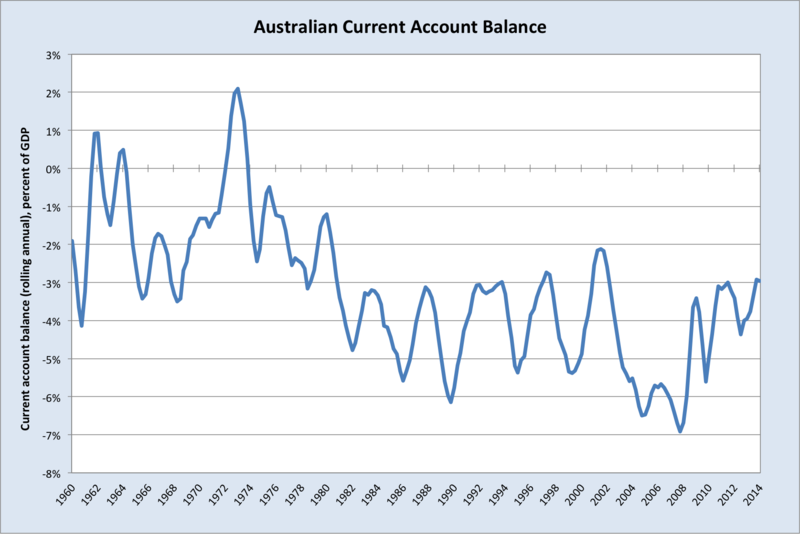 Indeed, before the financial crisis in 2008, Australia’s current account deficit reached record highs. This occurred by a combination of the rising real exchange rate and rising foreign borrowing. As the exchange rate rose, the cost of imports fell and households purchased more of them. There was also a significant increase in household leverage which began in the mid-1990s and continued through to 2008. After 2008, when households boosted savings out of current income (which lowered demand for imports), the trade balance sporadically swung into surplus, but owing to Australia’s substantial foreign liabilities, our net income on foreign investments is deeply negative, so the current account remained in deficit. This failure to record current account surpluses and reduce Australia’s net foreign liabilities during the boom years leads some to complain that Australia squandered the boom. I count myself among this group. Current account deficits certainly aren’t intrinsically bad; if there’s an abundance of productive investment opportunities in your country but insufficient domestic capital or technological knowhow to exploit them, then importing foreign capital is sensible. But what net foreign liabilities mean is that part of the income generated in your economy each year must flow overseas in the form of interest and dividends. Therefore, large accumulated deficits are a drain on national income. They also leave the economy exposed to the availability of foreign capital, which can pose risks to the banking system. I am of the view that the Australian government would have been better off running very big budget surpluses before the financial crisis, and parking these savings in an offshore sovereign wealth fund (whether this would’ve been politically feasible is another matter entirely). This would have been achieved by withholding almost all of the increase in additional revenues flowing from booming corporate tax receipts, which should have been further inflated by a pre-existing rent tax on resources. One consequence of this policy would have been lower household spending, including on imports, since tax cuts and middle-class entitlement spending fuelled consumption. With lower imports and booming exports, the current account deficit would have declined. In addition, lower household spending would have lessened the need for the RBA to raise interest rates as high as it did, which would have limited the appreciation in the real exchange rate. Again, this would have lowered spending on imports and eased the hit to non-mining trade-exposed sectors. Had this policy been in place when the financial crisis arrived in 2008, the federal budget would have been in such healthy shape that subsequent deficits would have been far lower, and in fact the budget could have conceivably remained is surplus. This would have afforded the government far more breathing room to set stimulatory fiscal policy today. This then is, or was, Plan C: Instead of allowing the real exchange rate to appreciate so strongly, irrespective of how it happens, lean heavily against the boom by running very big federal budget surpluses and reducing Australia’s net foreign liabilities. Some manifestation of Plan C was basically the alternative to Garnaut’s ‘Great Complacency’. In adopting this approach, comparatively subdued household spending acts as a release valve, mitigating the risk of the economy overheating. Contrast this with Plan B (real-by-nominal exchange rate appreciation), where it falls primarily upon the non-mining tradable-good sectors to shrink and so act as the release valve. A rise in the real exchange rate would undoubtedly have been necessary, but by shifting the balance and leaning against household consumption and borrowing, Australia would have improved its foreign debt profile (the net international investment position), its public finances would have been in much better health, and there would have been less hollowing out of tradable-goods sectors as a result of the boom. We can’t fully judge Plan B until we’ve seen how the economy performs in the bust, which is presently unfolding. 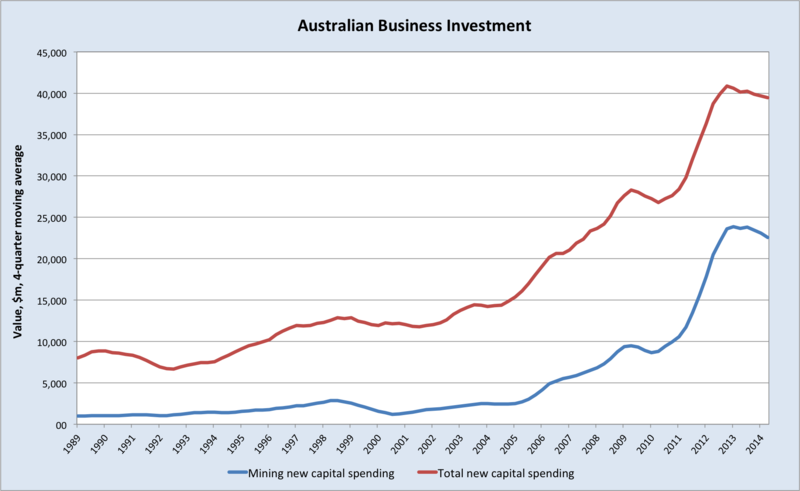 The key question is, will non-mining business investment and hiring rise quickly enough to offset the mining bust? It may yet do so, though the chances seem fairly slim. In my eyes, a greater emphasis on Plan C would appear to have been best option for the nation. Hopefully there’s another once-in-a-century terms of trade boom before too long so we can test that hypothesis! This entry was posted in Uncategorized and tagged Australia, current account, current account deficit, exchange rate, real exchange rate, terms of trade on November 20, 2014 by MJV. Throughout the Great Iron Ore Rout of 2014, we’ve comforted ourselves with the knowledge that, regardless of what came beforehand, at least the fourth quarter would deliver respite from the market’s flagellation, as Chinese steel mills hastily replenished their depleted stockpiles of iron ore. I have been loath to commit to the point too aggressively, lest a strong Q4 restock befool me, but there are very good reasons to suspect that this year the iron ore rebound will be much more muted than it has been in recent years. We should still see a rally from current low prices by the end of the year, but the risks are heavily skewed to the downside. India knocked some 100m tonnes of annual supply out of the seaborne market fairly rapidly in 2012 with its ban on mining in Goa, which followed similar restrictions in Karnataka in 2011 (total traded iron ore was about 1100m tonnes in 2012). If memory serves, Macquarie reckoned these moves added about $20 to spot prices throughout 2013.Chinese stimulus via fixed asset investment flowed freely in 2012, and, critically, the property sector commenced a strong upswing around the time iron ore bottomed. 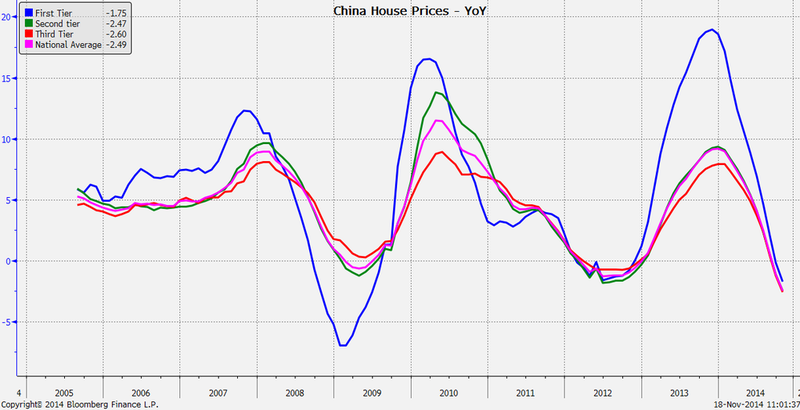 Property is moving in the opposite direction now, and like much else in the Chinese economy, oversupply is becoming an issue. It remains to be seen whether the government is prepared to allow this process to run, or whether they cave and unleash another ‘big bang’ stimulus, as many analysts and commentators are now clamouring for. My base case is that the government institutes mild stimulus measures to support overall demand, without igniting another explosion of shadow banking excesses or wasteful fixed asset investment. But it’s roulette really, all you can do is monitor the situation in Beijing closely. Due to a renewed upswing in Chinese demand, the loss of Indian supply tightened a market in which suppliers already held considerable pricing power. As everyone is surely aware, that is no longer the case now, with Morgan Stanley putting this year’s surplus at around 50m tonnes, growing to 150m next year. It has decisively shifted to a buyers’ market. The displacement of high cost supply, which the majors adduce to justify their enormous supply expansions, will help stabilise prices in time. But so far this has occurred much more slowly than anticipated, and I expect this continue and high cost supply to exit only incrementally, rather than in a rapid manner that shrinks available supply and compels Chinese steel mills to suddenly scramble for stockpiles. Thus, short of a ‘big bang’ stimulus from the Chinese government, the recovery in spot iron ore later this year is likely to be much more muted than in previous years. I still would not be surprised to see it rebound to around the high-$80s, but there is a good chance that the impetus for Chinese steel mills to restock as they typically did in the past just isn’t there now that the market is firmly in structural surplus. Well, we’re through the halfway mark of Q4 and there is no restock in sight. Quite the opposite, in fact; iron ore has capitulated horribly. 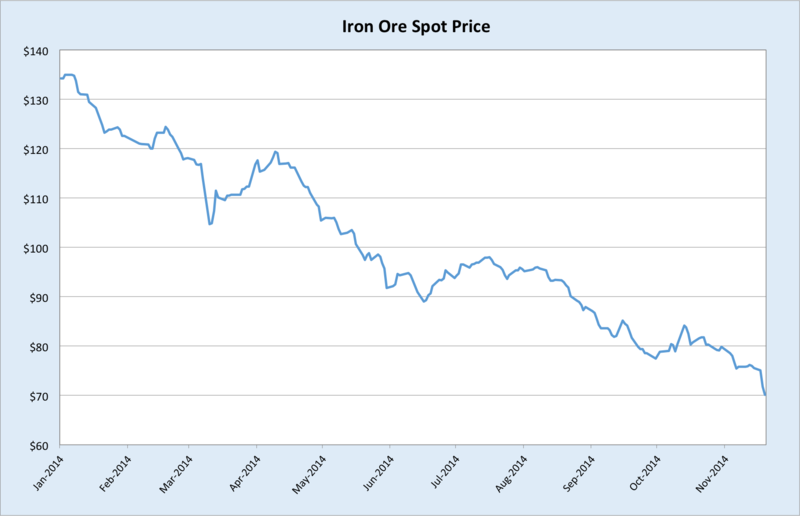 This reflects the fundamental shift in the iron ore market that has transpired this year. It is obviously no secret that the sellers is now firmly locked in a chronically oversupplied market and fighting to the death. It was always likely that this change in the market would kill off the restock-destock cycle, or at least greatly reduce its impact on pricing. The reason being that steel mills don’t need to worry about losing access to supplies as they did when shortages reigned, so there’s little pressure to aggressively scoop up stocks when they have the opportunity in anticipation of tight supply down the track. We’ll see buying before too long; these prices are surely looking enticing to some. But the shift in the market this year is structural, and we’ve got loads more supply coming next year. Any bounces into the year’s end are therefore immaterial, the sector’s fortunes are not going to be revived unless there is some radical shift in Chinese policy, and whether such a shift is even feasible anymore is debatable. 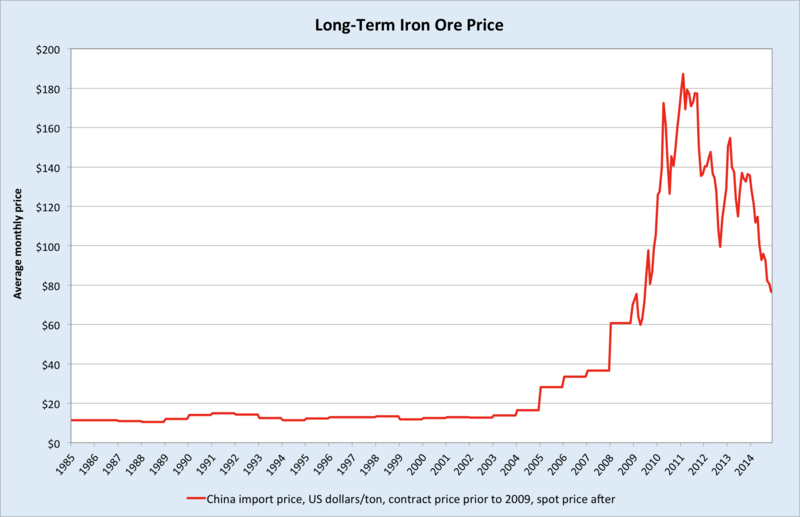 This entry was posted in Uncategorized and tagged China, iron ore, restock on November 19, 2014 by MJV. Australia is the West’s last best model. Such was the declaration of George Megalogenis in his book, The Australian Moment, published in February 2012. There’s little question that Australia has had a good run over the past quarter of a century. We graduated from an middling developed economy to be one of the most prosperous nations on Earth; from 1991 through to 2014, Australia’s income per capita rose from 20th in the world to 6th. We boast an educated, multicultural workforce, sound institutional and regulatory frameworks, and a great abundance of vital natural resources. As with all economies, Australia has weaknesses, but surely these were put to the ultimate test in 2008/09 as financial crises ripped through the global economy? And yet still our recession-free run remained unbroken. The central thesis of The Australian Moment is that Australia distinguished itself from its developed-world peers through a pragmatic commitment to economic rationalism; deregulation and global engagement without financial sector debauchery. For the most part it’s a worthy book. Drawing on the recollections of past prime ministers, and insisting that they focus on the merits of their successors and/or predecessors (a request Keating simply could not abide), Megalogenis presents a sound history of Australia’s post-Menzies reform agenda and the reorientation of Australia’s key economic partnerships away from Europe and North America, and towards Asia. When he reaches the new millennium, Megalogenis is correct, in my view, that Howard and Costello failed to advance the cause of reform beyond the GST and handed out too great a share of windfall tax revenues, embedding a structural deficit in the federal budget. He also recognises that household debt ballooned excessively, and that our infatuation with property is a wasteful use of capital. Nevertheless, instead of concluding that Australia squandered much of the boom, which seems the logical result from his analysis, Megalogenis reaches the opposite conclusion: Australia is the West’s last best model. This honour, this Australian moment, is bestowed by Megalogenis mainly for what he sees as our finest hour: a vigorous and rapid deployment of government stimulus to beat back the menace of global recession in early 2009. This left Australia the stand-out among wealthy nations; a model to be emulated. According to Megalogenis, this was what Australia’s politicians and officials heard in the aftermath of the crisis, as shellshocked policymakers from less nimble nations tried to make sense of the carnage. In fact, as articulated by Treasury Secretary Ken Henry, the magic formula was not especially esoteric: ‘Go early, go hard and go households’. Rudd went harder. In October 2008, a day short of a month after Lehman Brothers filed for bankruptcy, the first wave of stimulus was announced. It consisted of a $10 billion ‘cash splash’ to get folks spending through Christmas, a doubling of the first homeowners grant for existing homes, and a trebling for new homes. This was followed by a second round of cash payments in February 2009 and a $28 billion commitment to public investment, with the largest initiative being the school buildings program. In addition to fiscal stimulus, Australia’s monetary authorities responded decisively. Between March 2008 and April 2009, the RBA slashed the cash rate from 7.25% to 3%. 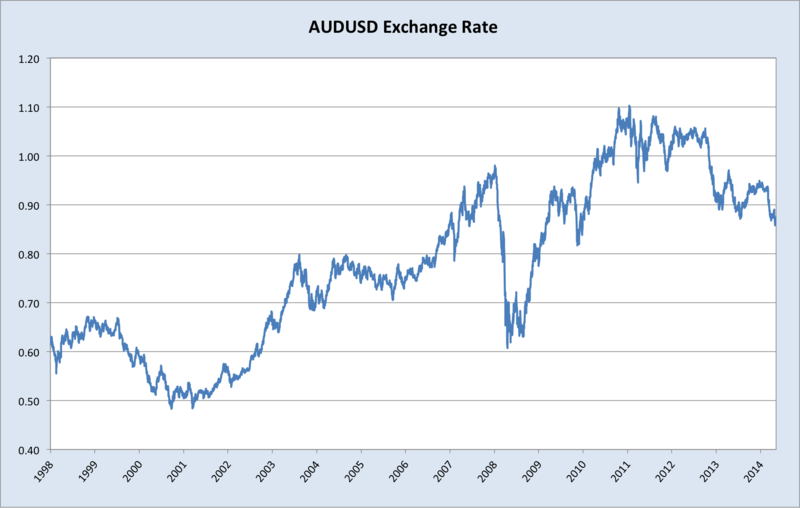 Partly because of this, the Australian dollar went into freefall, losing close 40% of its value against the US dollar between June and October 2008. Australia dodged a technical recession in 2009, and recorded much stronger growth and lower unemployment in subsequent years than most developed economies. Despite this performance, the economic sense of the Rudd/Swan stimulus packages has been the subject of intense (and intensely politicised) debate. This isn’t my primary interest here. The question I’m addressing is: Was the stimulus of such importance to Australia’s economic performance that it set the ‘Australian model’ apart internationally? Was Australia’s success mainly due to something Australia did that other nations didn’t do? Or was it something the global economy did to Australia which is didn’t do to others? With regards to household behaviour, the stimulus basically achieved its ends. 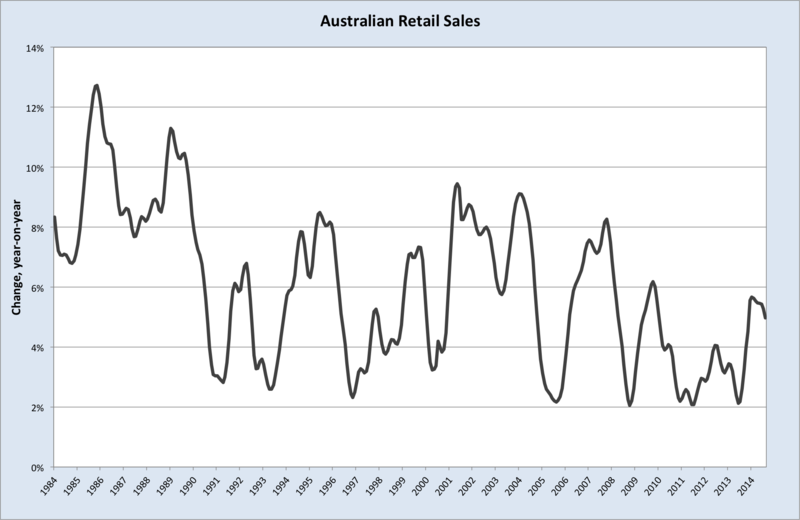 In 2009, when consumer spending was sliding across much of the globe, Australian retail sales registered a comparatively healthy bounce. The cash was splashed. The boost to the first homeowners grant also produced the desired effect. Australia has expensive houses and highly leveraged households, making us vulnerable to housing shocks. For a few fretful months it appeared that local house prices might follow America’s into the dirt. Thankfully it was not to be. One of the myths that has developed since, and which is reinforced by public opinion polls, is that China saved us. But China had a bigger slowdown that the United States in the first half of 2009. Australia’s terms of trade fell for four quarters in a row from the December quarter 2008 to the September quarter 2009. The quarry was’t as important as people thought. Not for a few months in 2009, perhaps. 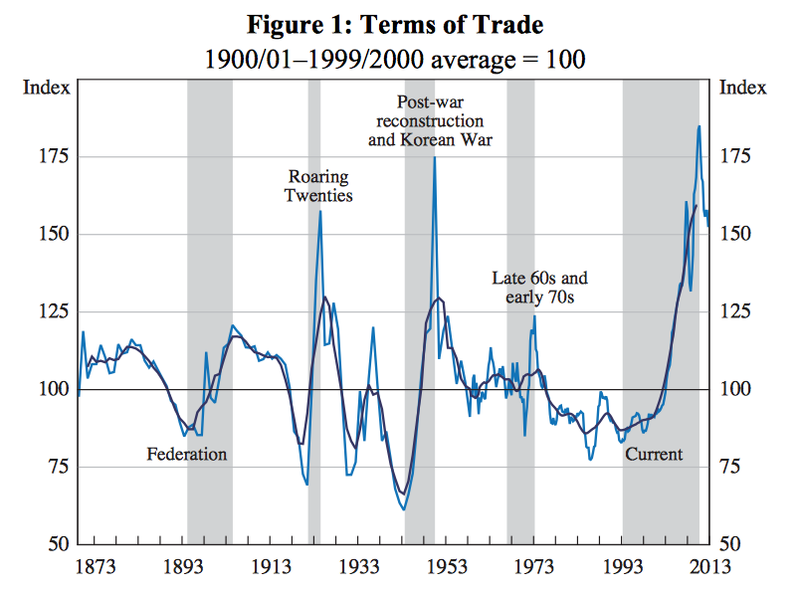 But what would have happened if the terms of trade continued to nosedive? 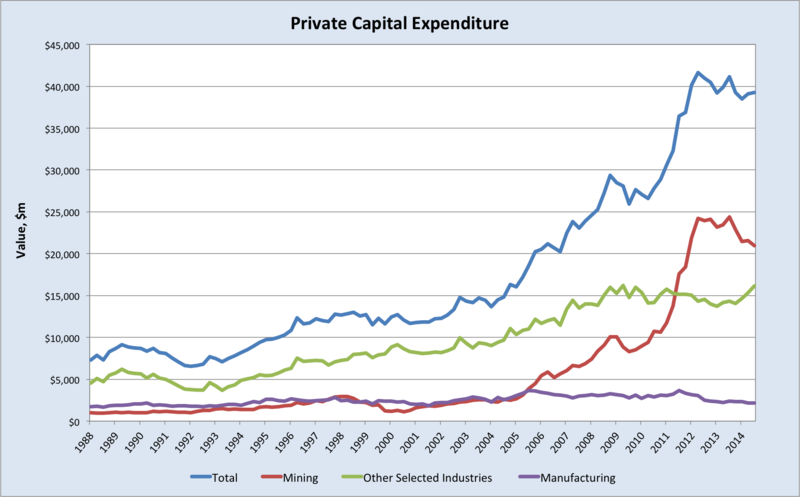 What would have happened if the resource sector slashed capital expenditure? It may have subtracted from growth in 2009, but the resource sector very quickly reapplied the throttle. And of course, this turnaround owed little to the recession-fighting prowess of Australia’s policymakers. Examining our key export commodities in further detail, we get a deeper impression of their contribution. Even more significant than the swift rebound in export earnings, I would argue, was the arrival of an investment boom in the resource sector. As late as 2007, Santos, Oil Search and ExxonMobil were intending to pipe gas from PNG into the Australian market. As coal seam gas emerged as a substantial source of domestic supply, this plan was abandoned and reworked into an LNG project (which was switched on a few months ago). This decision, and of course the promise of robust Asian demand, triggered something of an LNG arms race. As far as I know, at its peak there were 13 projects planned across Australia (some of which have since been shelved), valued at around $220bn. A flurry of capital spending began to take effect in 2010, shortly after the terms of trade turned higher. In addition, substantial investment took place in iron ore capacity expansions. The timing of the investment boom was impeccable, greatly adding to private business investment at a time when it was all but dead across the developed world. Business investment is typically the most volatile aggregate spending component, and usually exacerbates business cycle fluctuations, so bucking this trend was critical to Australia’s post-crisis performance. We must also consider that the Australian economy’s fundamentals were relatively healthy when the crisis hit. Unlike the US or the UK, where leverage and housing bubbles were the chief propellants of economic activity, Australia was at least riding a legitimate terms of trade boom. This meant that aggressive measures to stimulate consumption spending and invigorate the housing market were far more effective in Australia than they were in economies which for years had already been almost entirely reliant domestic bubbles for ‘growth’. Moreover, the level of the terms of trade and the Australian dollar in 2008 meant that Australia’s currency depreciation was particularly potent, supporting profits and jobs without delivering an overly traumatic shock to household purchasing power (since the nominal exchange rate had reached such a high level before it fell). So while I don’t deny that the stimulus had an impact, more important forces took precedence in fairly short order. The stimulus probably wasn’t bad policy at the time, no one really knew how bad things were going to get in early 2009, but Australia’s economic performance over the past 5 years has been overwhelmingly driven by international trends beyond the control of its policymakers. The Australian moment identified by Megalogenis simply wasn’t replicable in most developed countries (Norway and Canada are probably the only close analogues). So if we’re to uncharitably deprive Australia’s technocrats and politicians their a moment in the sun, should we discard the notion of an Australian moment altogether? Clearly not, for two reasons. Firstly, the boom was one of the biggest, if not the biggest commodity boom we’ve experienced. It was a hell of a moment! Secondly, a complacent confidence that the boom would underwrite Australia’s long-term prosperity pervaded both industry and policymaking circles, and for that reason we should pay heed to the siren song of Australian Exceptionalism. This entry was posted in Uncategorized on November 19, 2014 by MJV. I’ve focused a fair amount of attention on gold in the past fortnight, as it first approached, then hammered through, support around $1180. The effort to break that level and manage some followthrough had left gold quite oversold. Last night we saw a strong response from the market confirming this, with gold rallying around 3%, closing just under previous support. The proximate excuse for the rally was a minor miss on the non-farm payrolls release, coming in at 214k vs expectations of 235k, down from 256k last month. The unemployment rate ticked down to 5.8% from 5.9% last month. It wasn’t a bad report all in all, although average hourly earnings missed again, reminding us of the absence of wage pressures or inflationary pressures in general. Equities held up fairly well, as did the USD, which pulled back from its recent (stretched) highs, but did not fall out of bed by any means. Gold’s rally was therefore largely on its own back. A widely-held view says we’re in the final stage of the bear market for precious metals, with buying opportunities likely to present themselves soon. Short Side of Long has a good piece making the case today. It’s fair to say that on most indicators precious metals were looking too heavily beaten down. This didn’t phase me a great deal, as I was looking for those indicators to get truly extreme (with gold approaching $1000) before the bounce. You can never be sure about the market’s psychology until after the fact though, and last night was instructive: good buying interest, coupled with skittish short-covering. So was that the bottom? 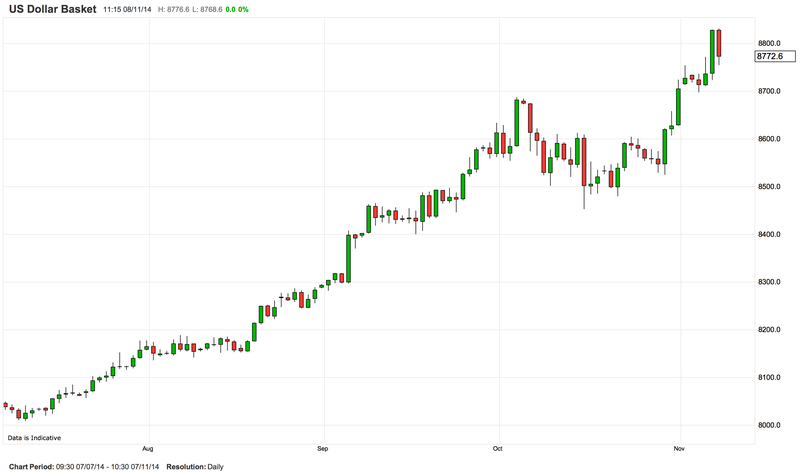 Can we discount the possibility that gold will test $1000 as has been my stated target? 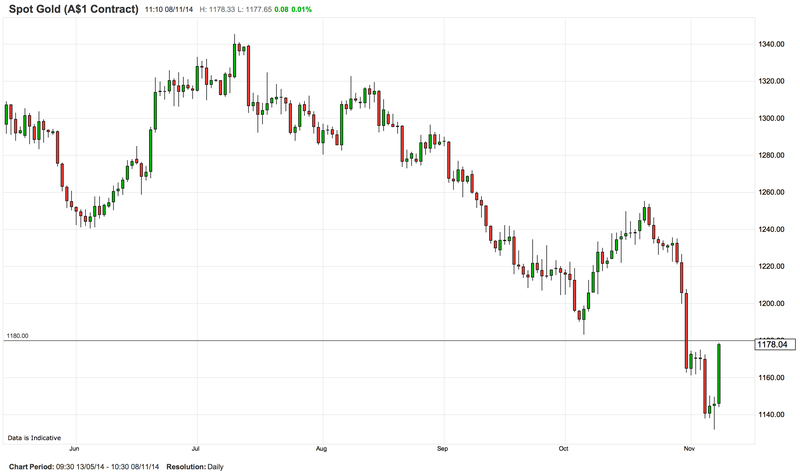 Firstly, there’s the short-term question of whether gold has further to sell-off on the back of its technical breakdown. Secondly, there is the broader issue of whether we are actually in the final stage of the bear market. Is a sustained reversal in direction approaching in a matter of months not years? Or are we looking at long, multi-year bear market ahead of us? On the first point, last night’s rally was the first sign of solid buying interest we’ve seen in over a fortnight, and a positive for gold. It’s failure to close above $1180 suggests a lack of conviction however, and my inclination is to read last night as a short-covering relief rally, with more falls to come. Nevertheless, it would take some cojones and disciplined risk management to opening new shorts at this point. The second question is much deeper and relates to the performance of the USD over the next few years. The performance of the USD in turn depends on relative macroeconomic trends in major economies (or more accurately, the reactions of various central banks to those macro trends). I’ve written about my thoughts on the dollar in the last post, but I’ll return with a more detailed look at its historical relationship with gold when I’ve got a bit more time. This entry was posted in Uncategorized and tagged gold on November 8, 2014 by MJV.